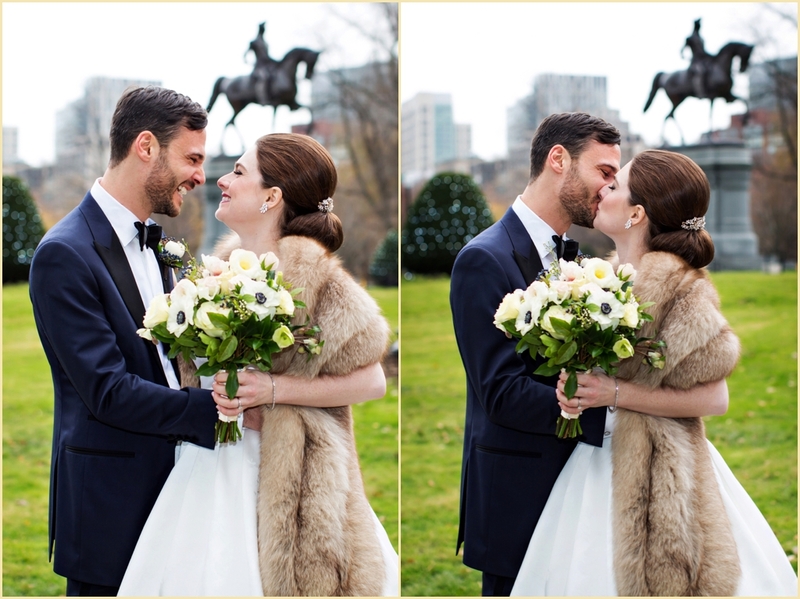 Maggie and Mike dreamed of a classic winter wedding in Boston, and their beautiful and elegant wedding at the Taj Boston and Hampshire House was exactly what they had hoped for! 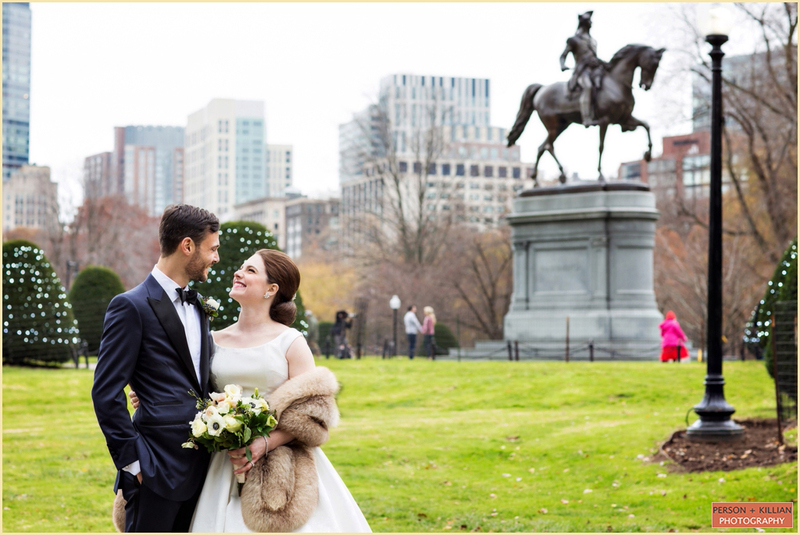 This winter wedding was before Boston saw its first big snowfall, but the couple still took advantage of all the winter details around the city. 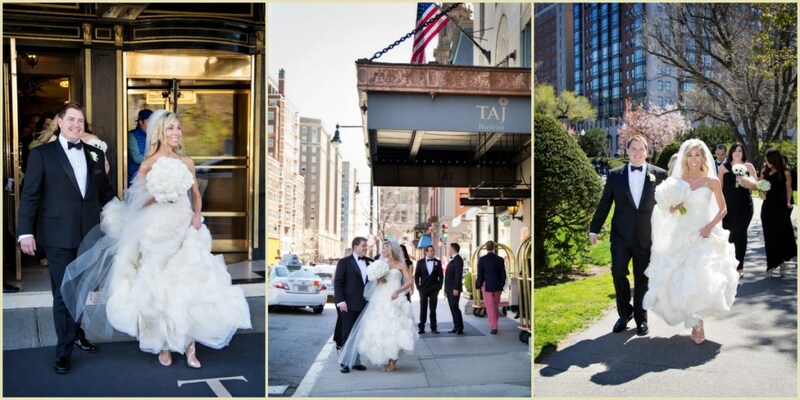 The couple began the day at the Taj Boston — Mike with his groomsmen, and Maggie with her bridesmaids (as well as the couple’s adorable dog Bonnie). 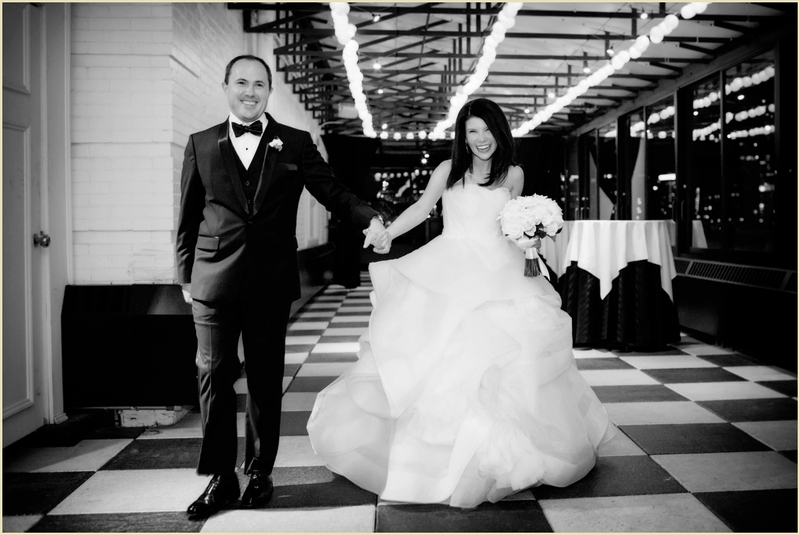 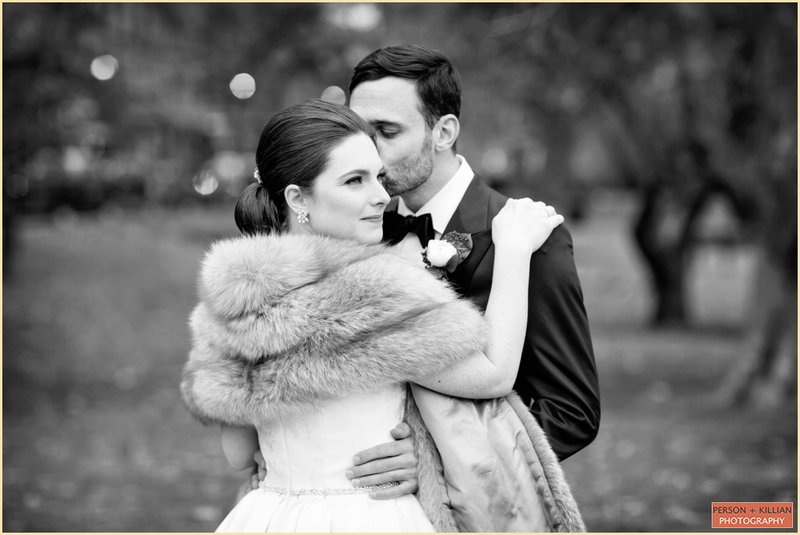 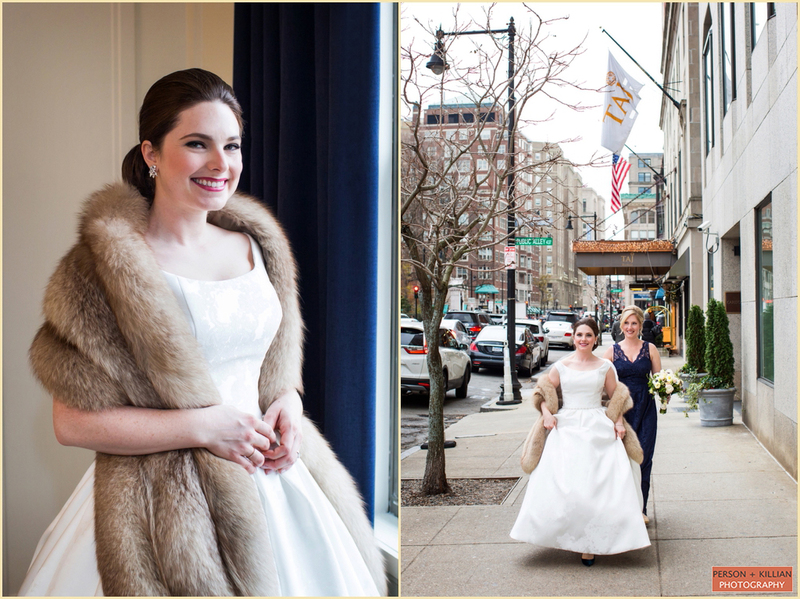 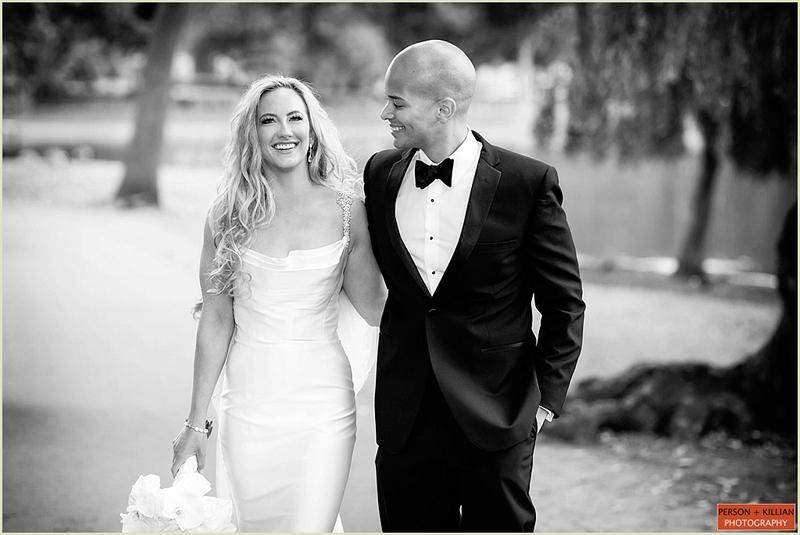 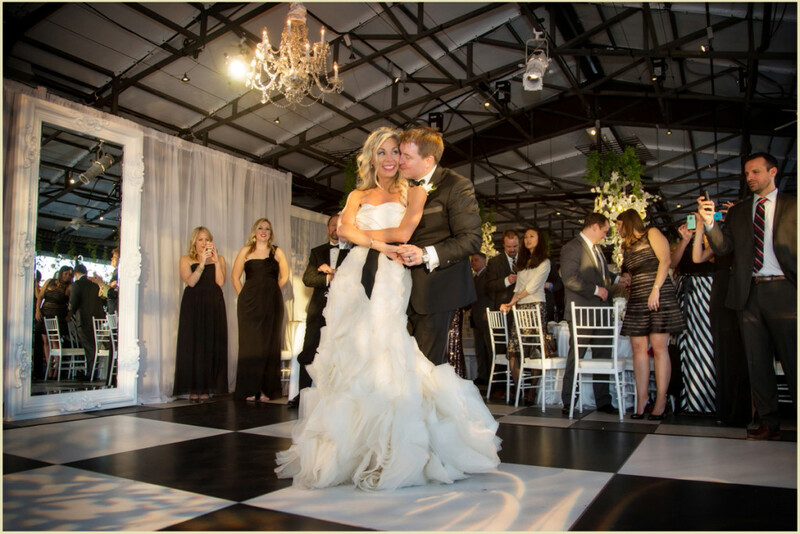 Maggie accented her wedding gown with a gorgeous fur wrap, perfect for outdoor photos in the winter. 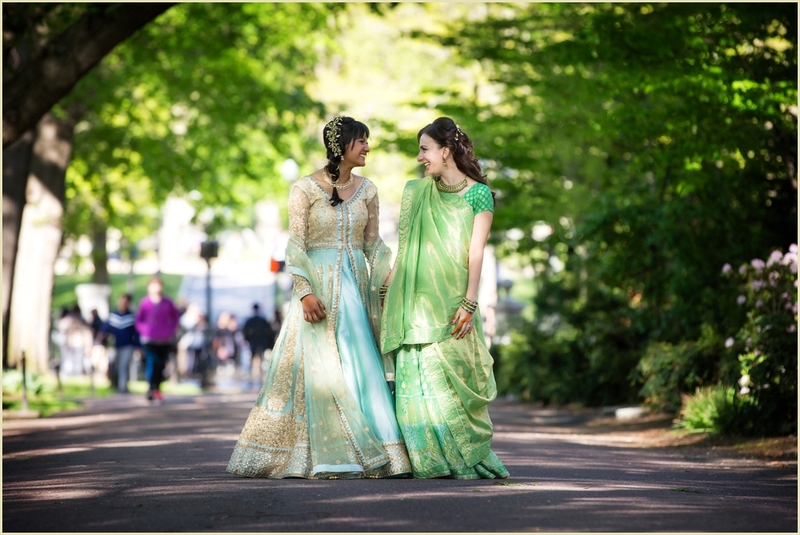 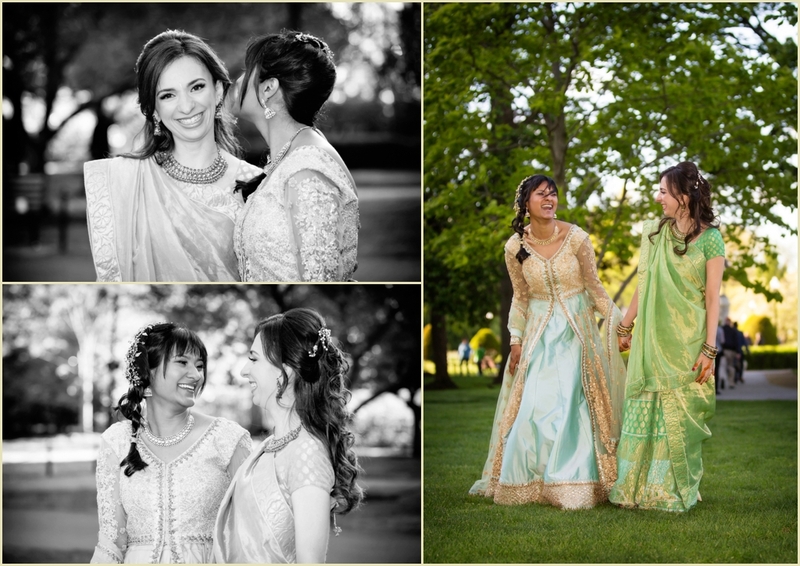 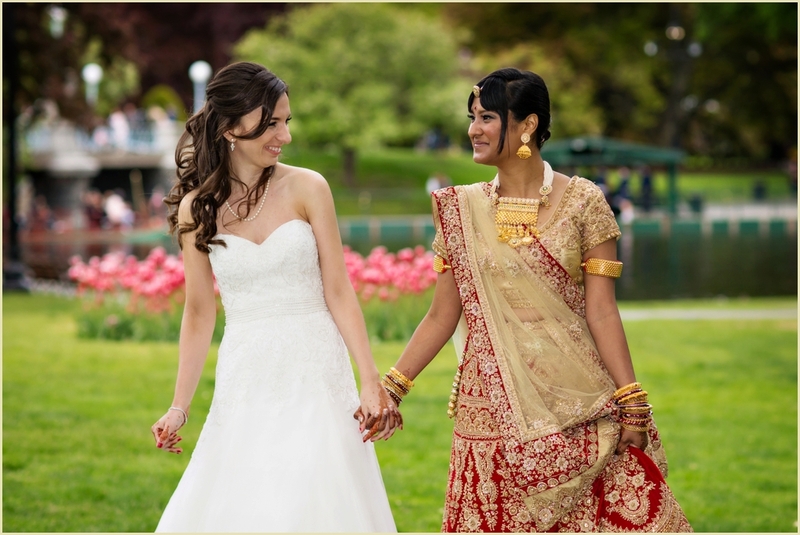 The couple met in the Boston Public Garden, directly across the street from the Taj Boston, for their first look and formal photos in the park. 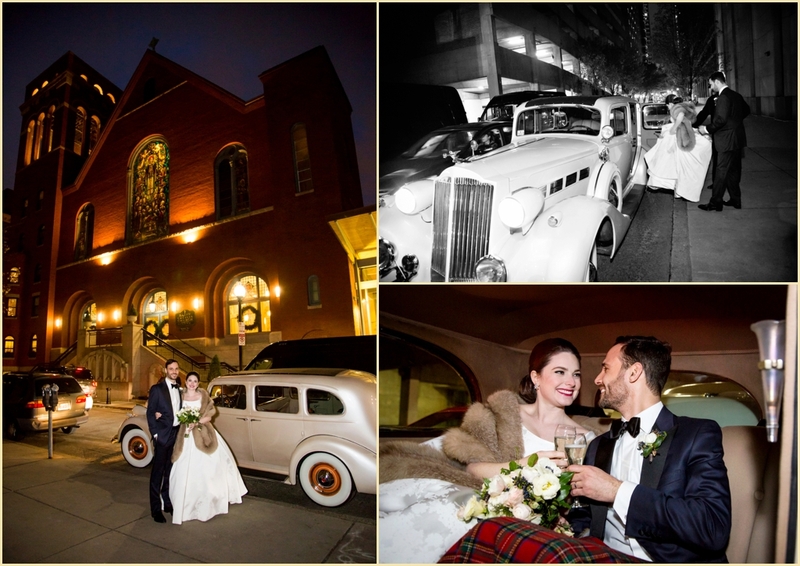 Then it was off to St. Cecilia’s Parish just a few blocks away for the wedding ceremony. 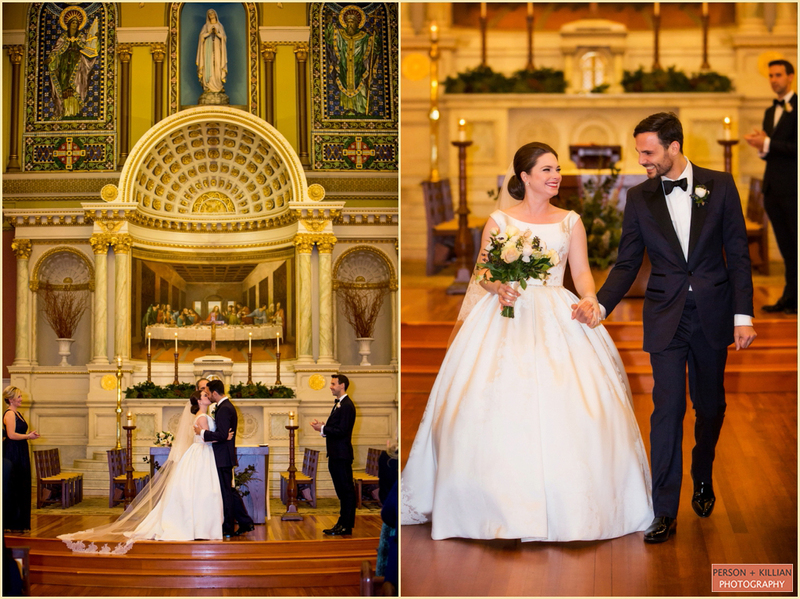 Maggie and Mike became husband and wife in a full Catholic mass ceremony, surrounded by friends, family, and loved ones. 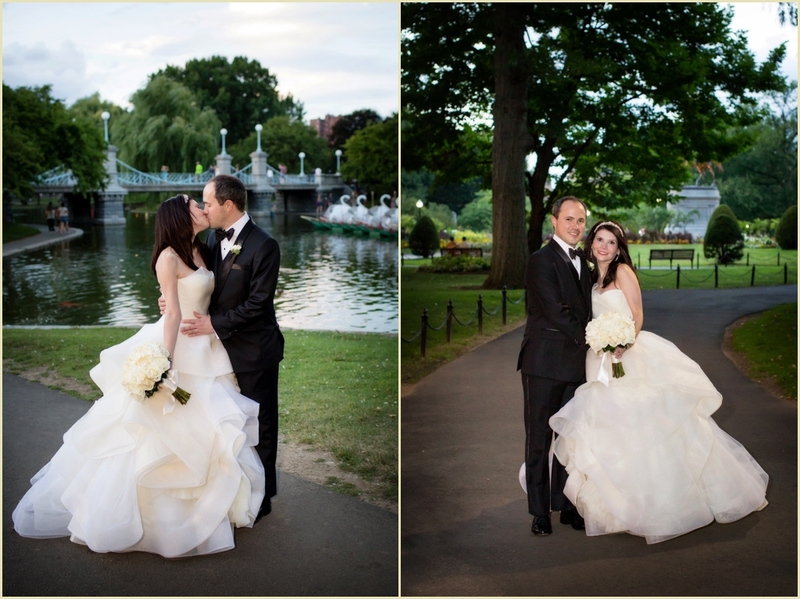 Evening had fallen in the city after the ceremony was finished, and we took the newlyweds out to Commonwealth Avenue on our way back to the reception for a few more photos. 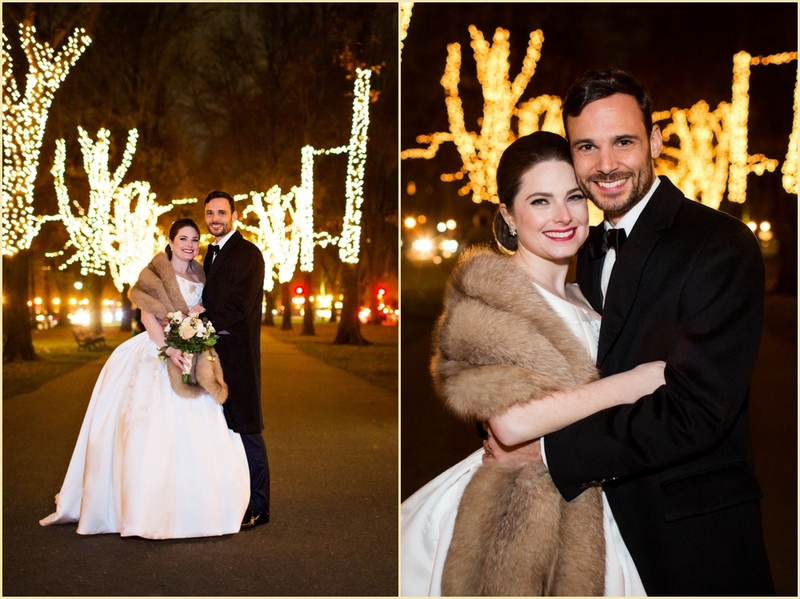 Around this time of year Comm Ave is lined with sparkling holiday lights, which made the perfect backdrop for some classic winter wedding photos. 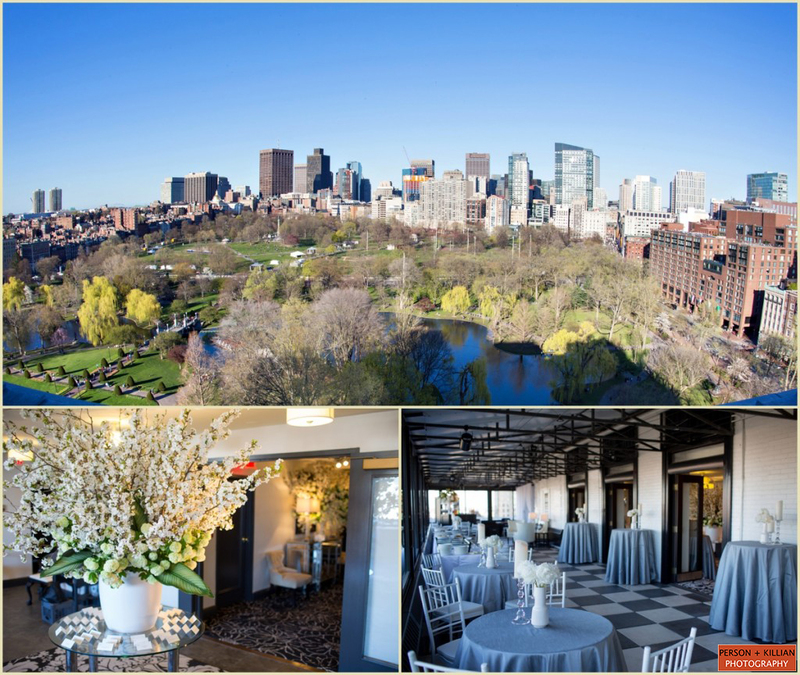 The reception was held at the Hampshire House in Beacon Hill, with cocktails and hors d’oeuvres starting on the Hampshire House’s third floor. 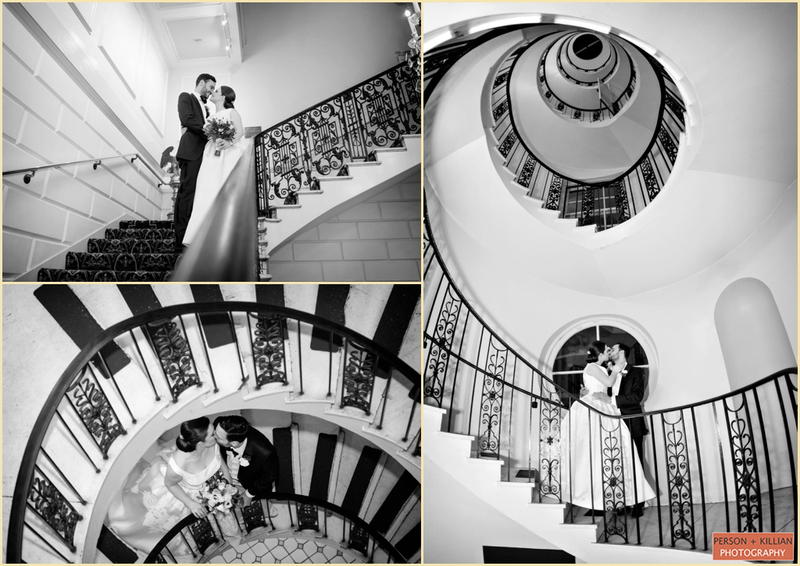 We took advantage of the House’s stunning spiral staircase for some photos with the newlywed’s, then the party moved downstairs to the second floor for dinner. 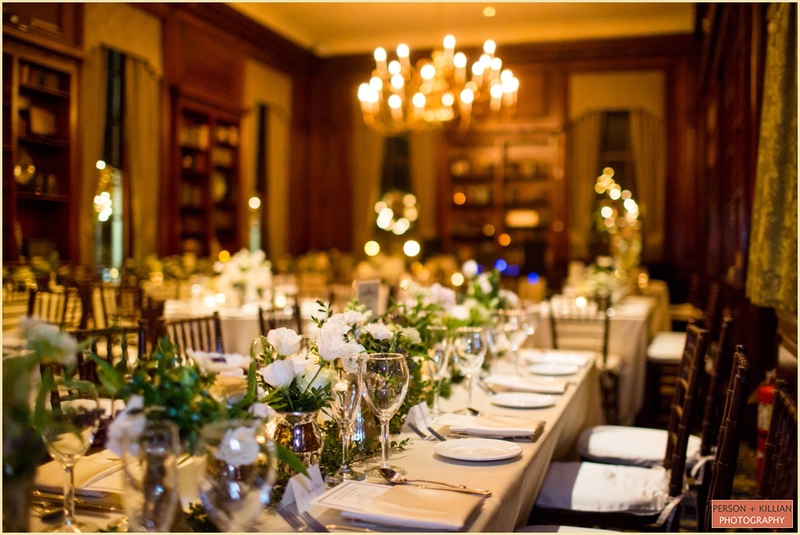 The couple chose classic white with a few pops of blue for their winter wedding decor — the neutral palette matched perfectly with the Hampshire House’s already rich and historical design. 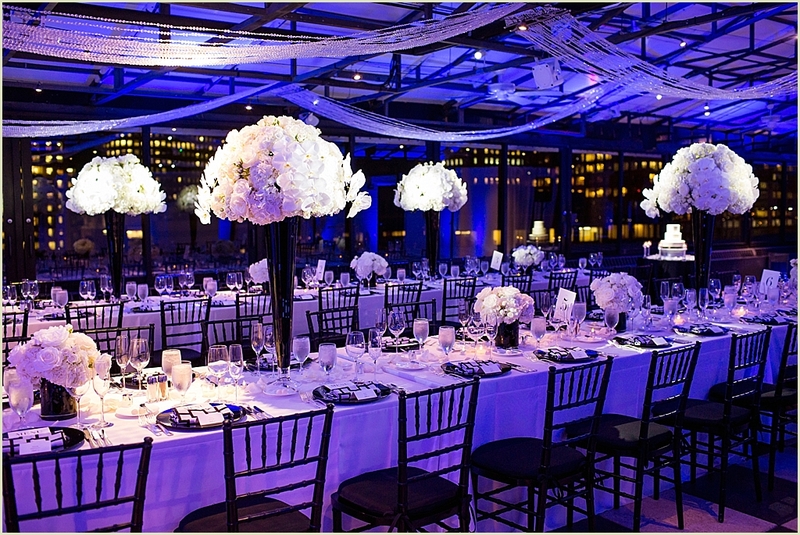 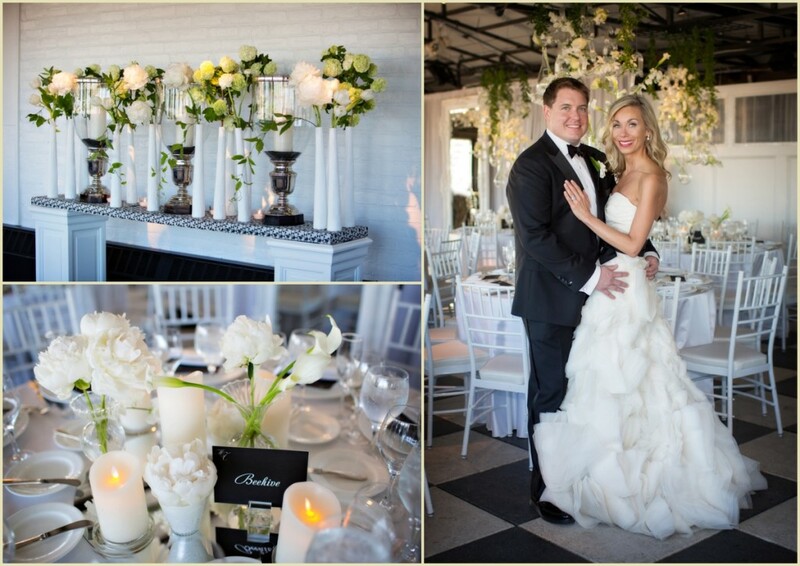 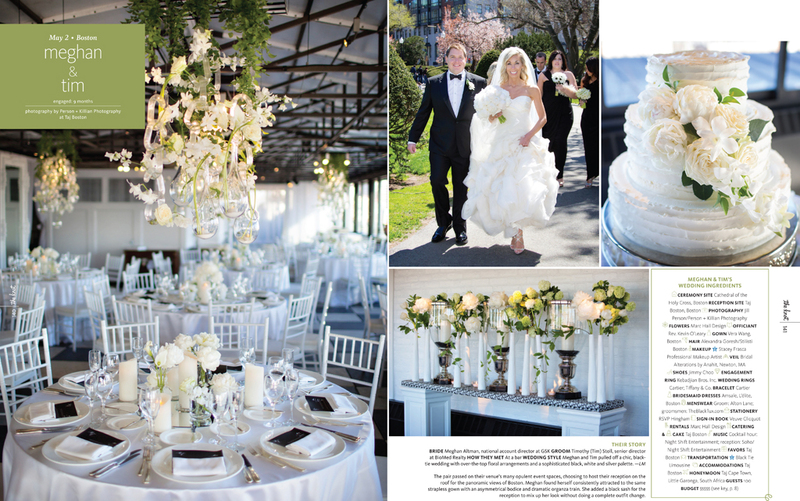 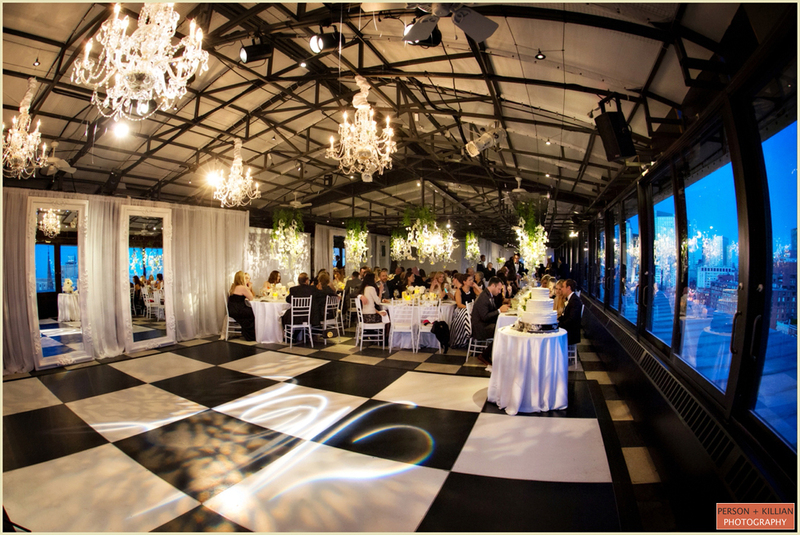 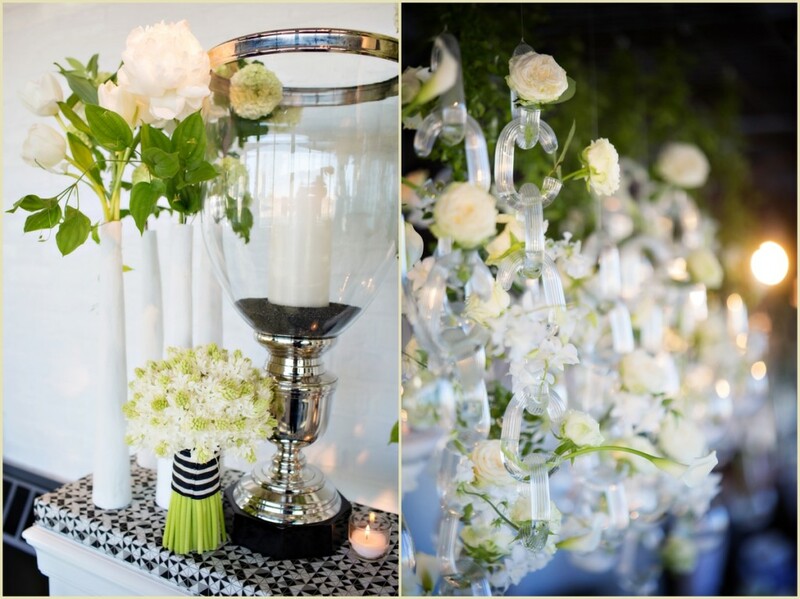 Silver vases held gorgeous white floral arrangements, and soft candlelight glowed throughout the room. 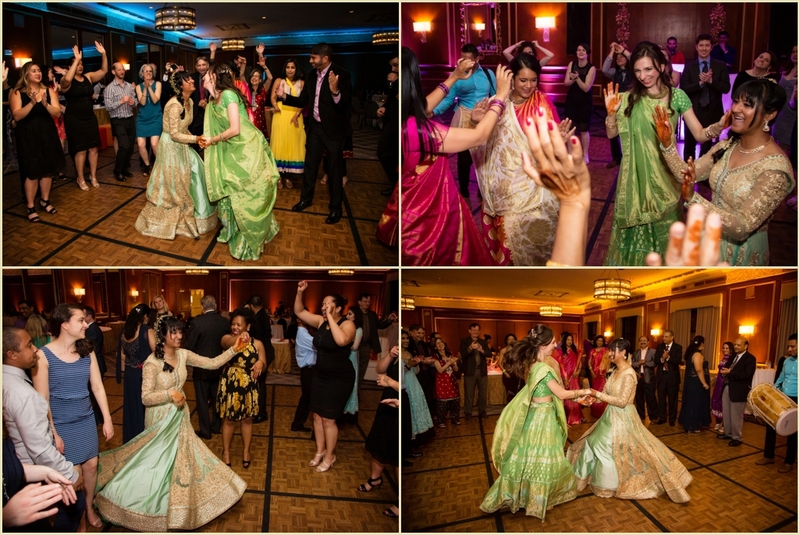 Following dinner, guests moved up to the third floor for dessert and then back down to the second floor for dancing. 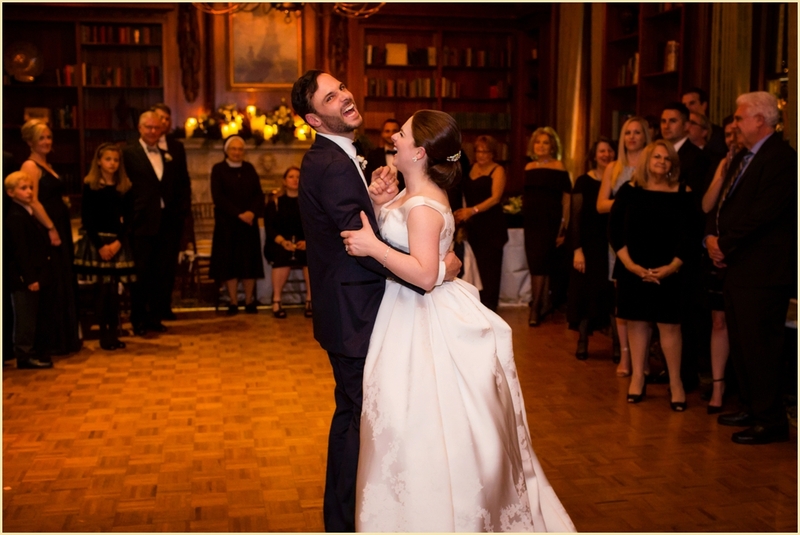 Maggie, Mike, and all of their guests danced the night away at this beautiful winter wedding celebration — exactly how they had imagined it. 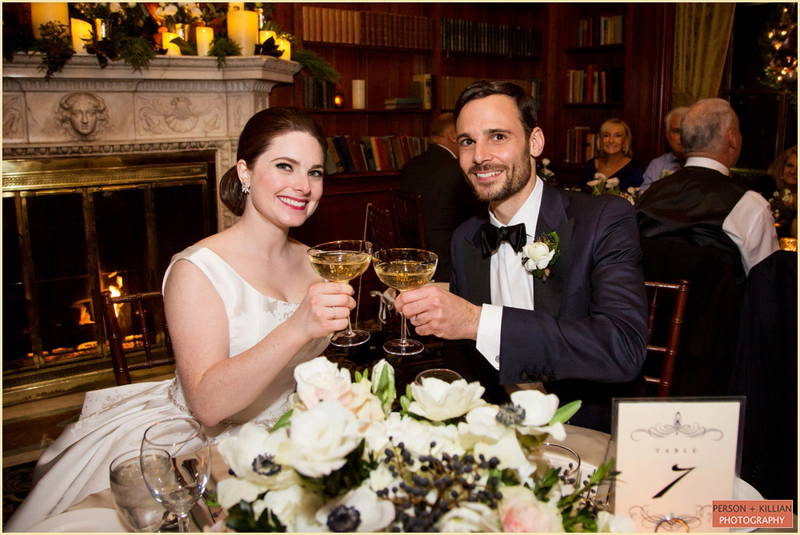 Thank you to Maggie and Mike for including us in your wonderful wedding, and to the Hampshire House for sending this fantastic couple our way! 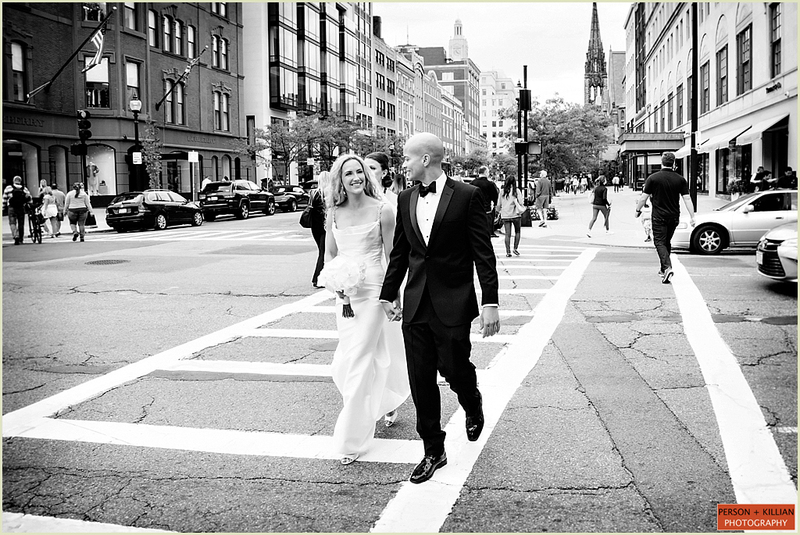 It’s late September in Boston, and Sarah & Sam are celebrating their beautiful Taj Boston wedding weekend in the heart of the city. 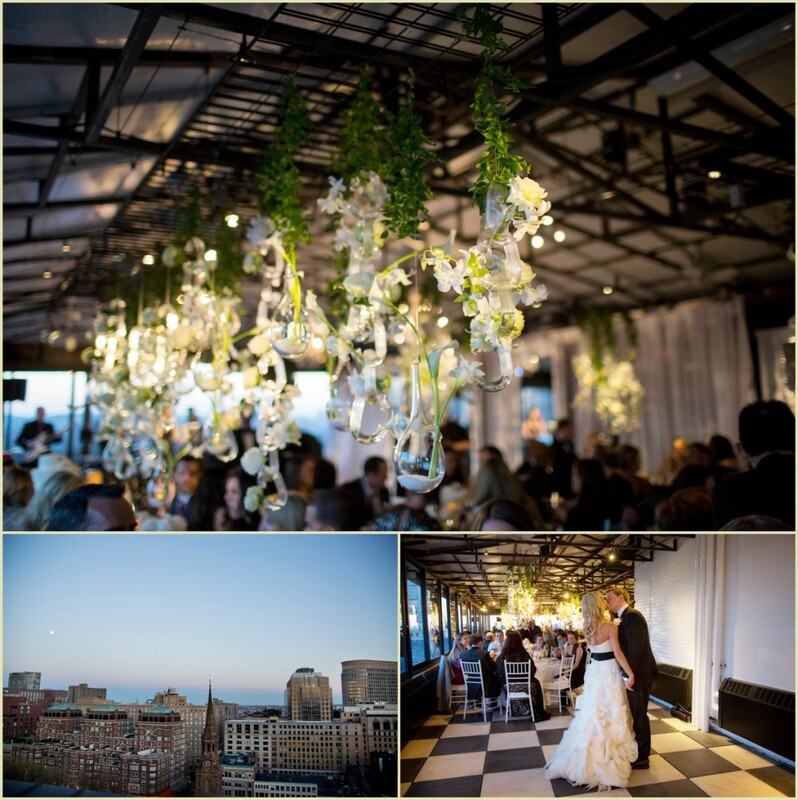 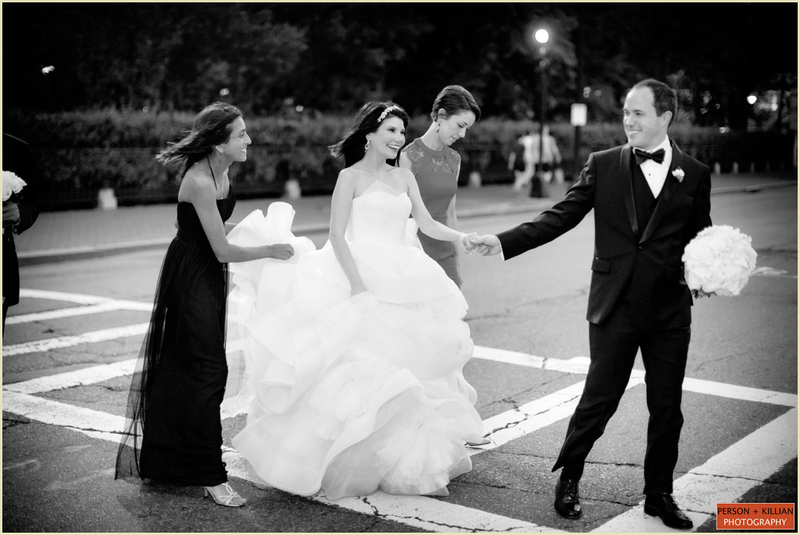 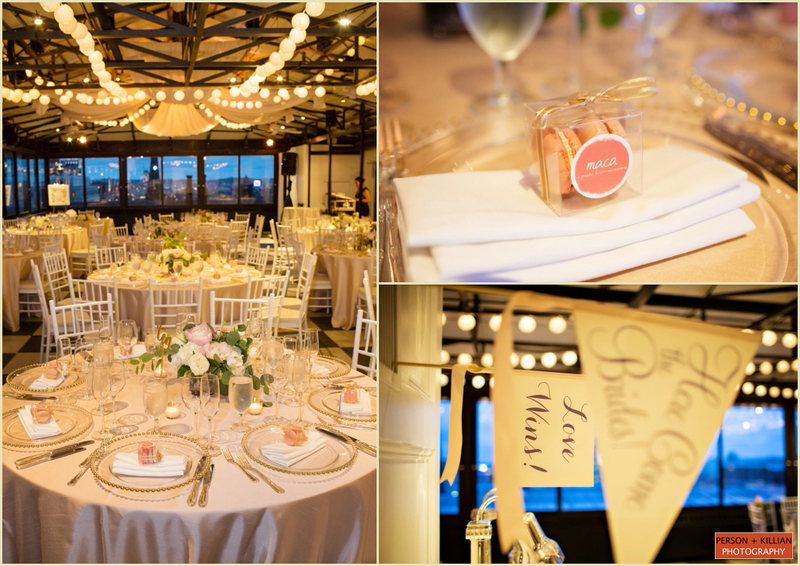 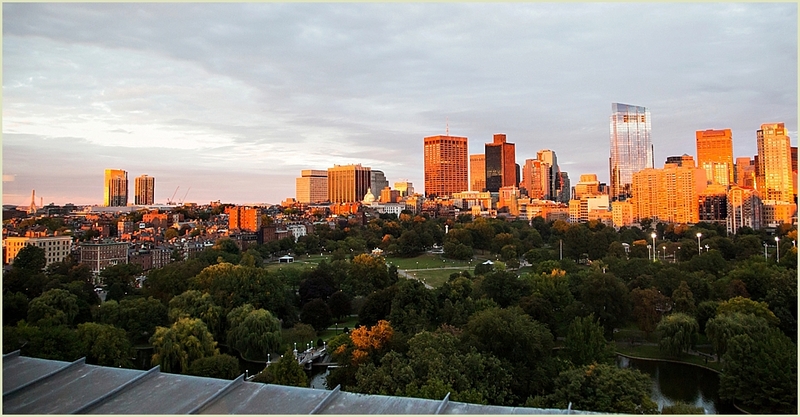 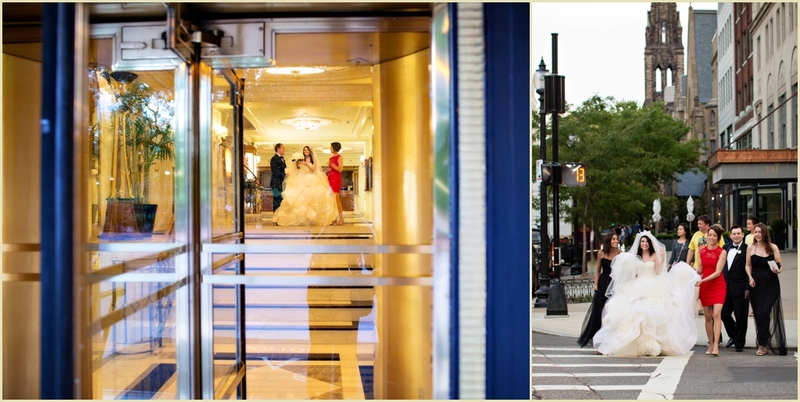 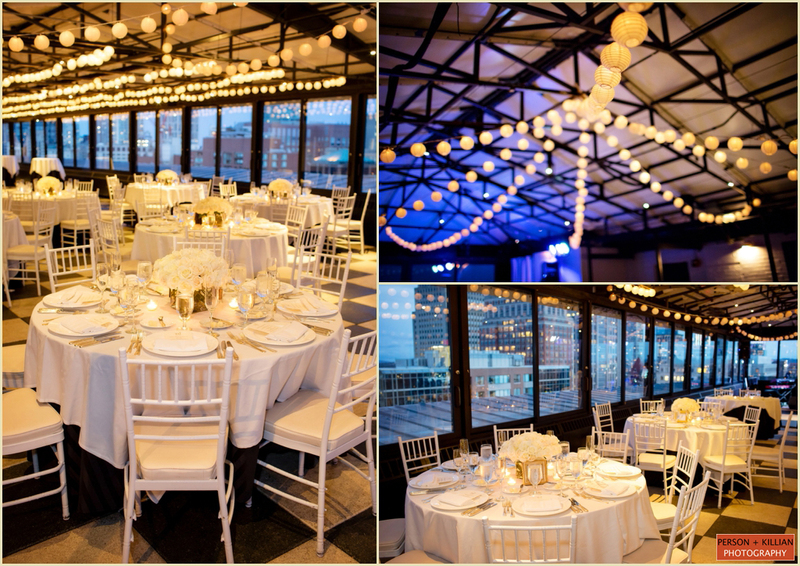 Everything from the preparation to the ceremony to the formal photos to the evening reception took place right in Downtown Boston, and gave the bride and groom as well as their guests some of the best of what this city has to offer! 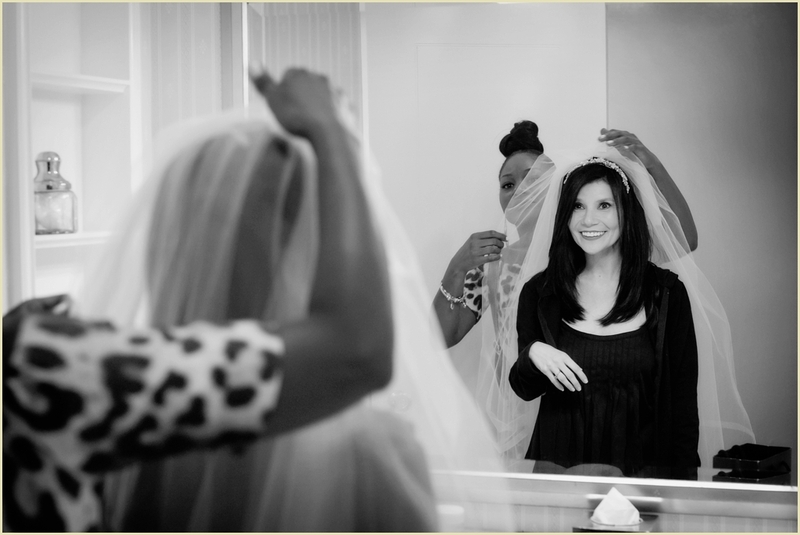 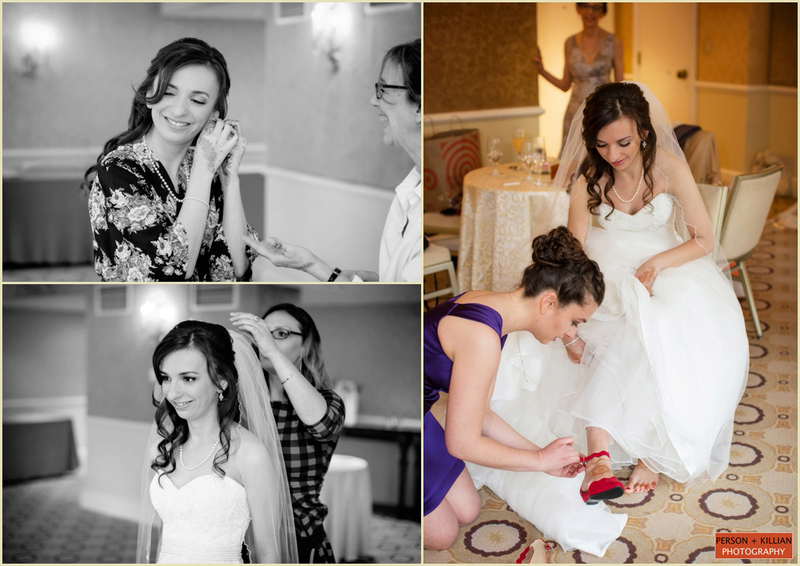 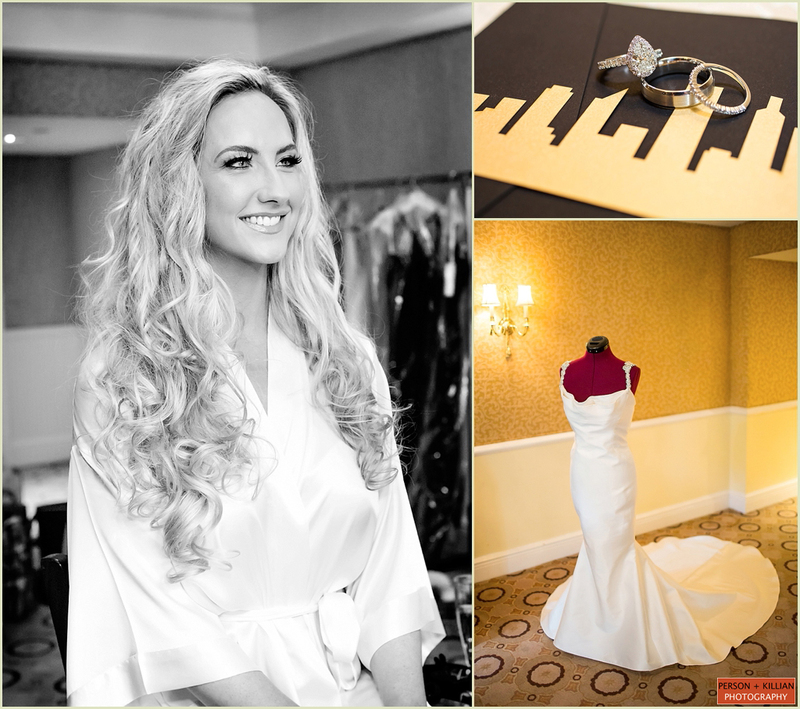 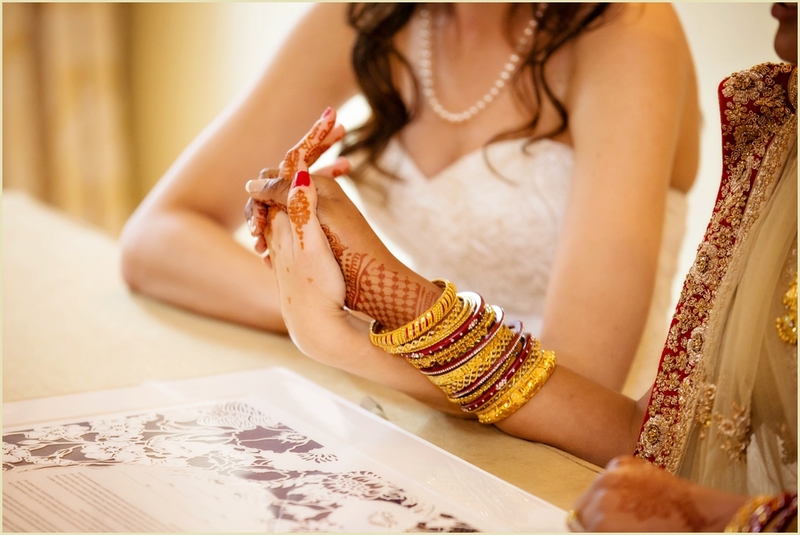 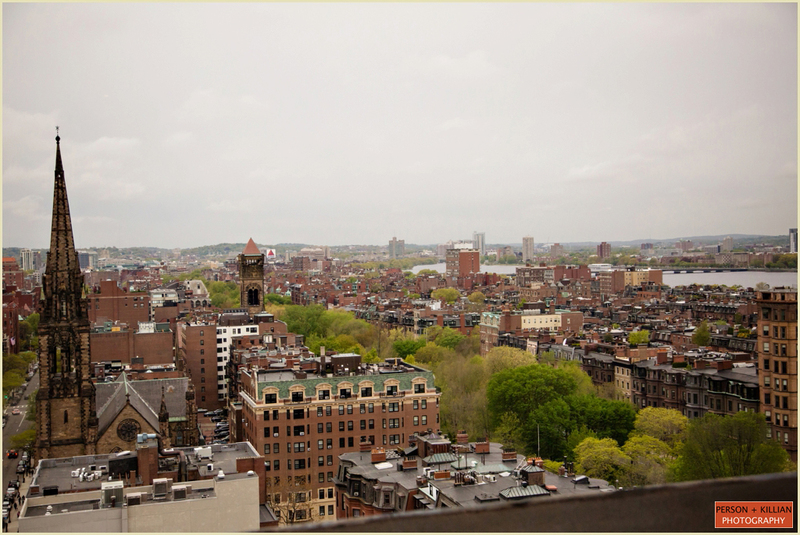 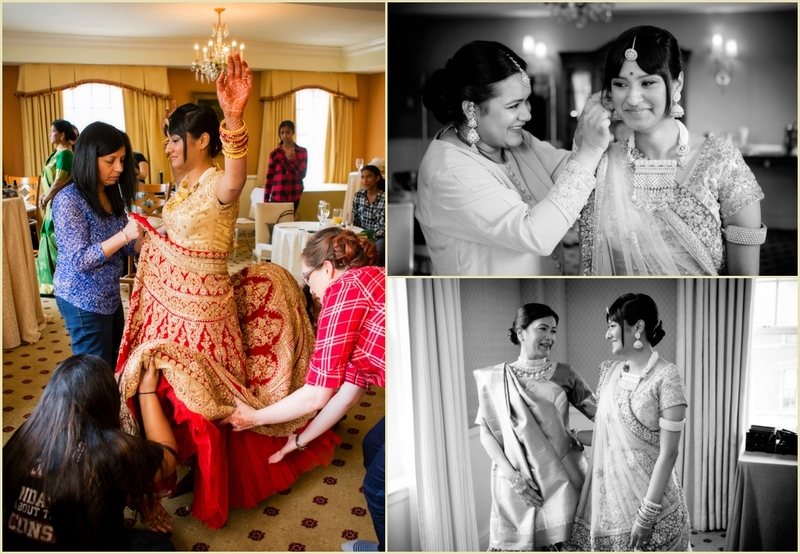 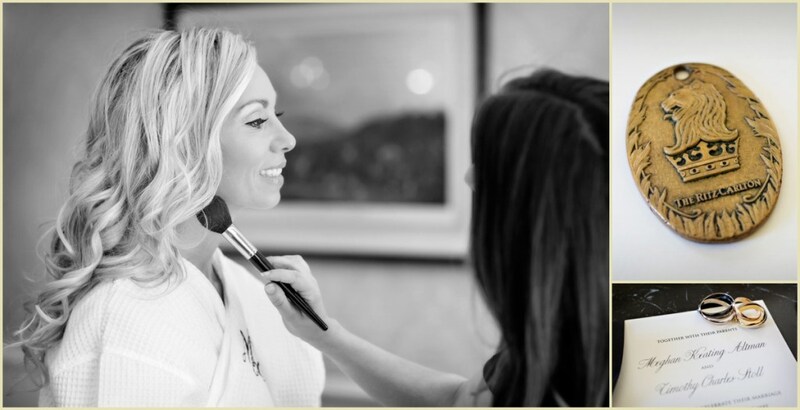 Sarah and Sam both started their morning in the Taj Boston, getting ready for the big day with their wedding party. 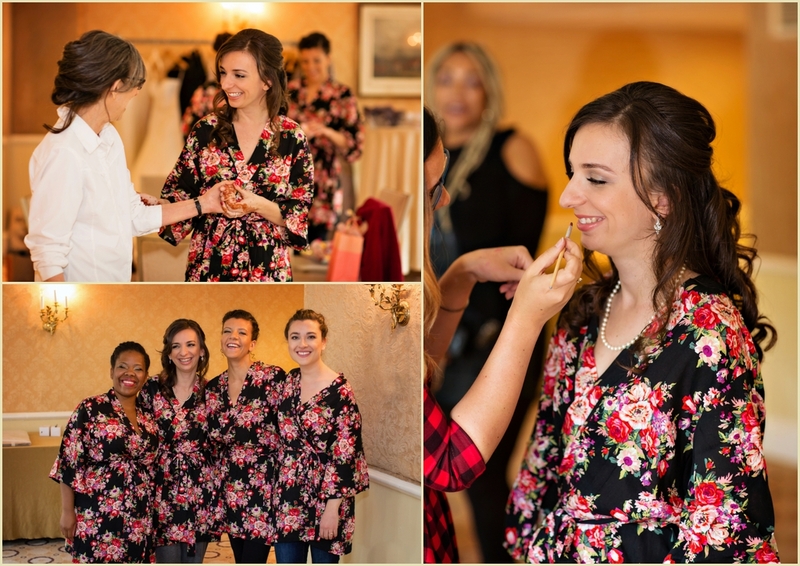 After everyone was dressed and ready, the bridal suite was cleared out so the bride and groom could have their first look moment together. 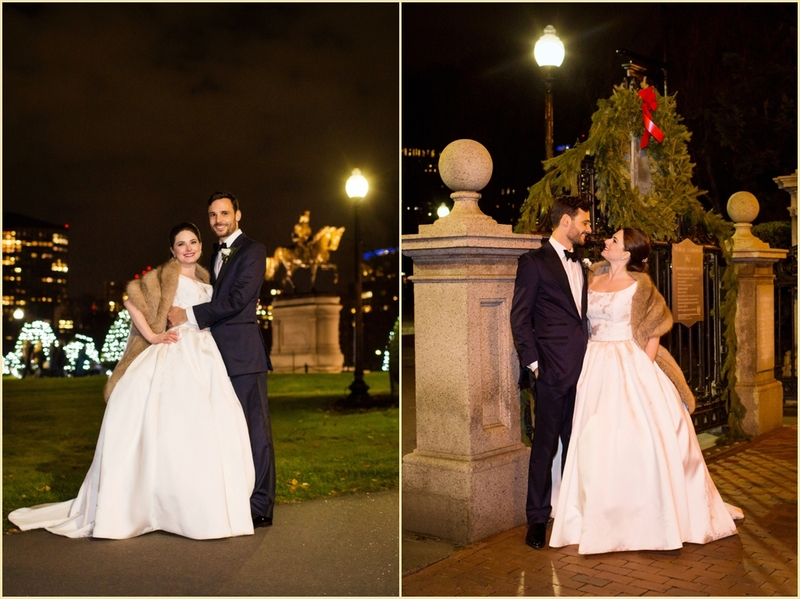 We then took a quick walk across the street to the Boston Public Garden for some formal photos with Sarah and Sam, before hopping in an Uber to get to the church just a few blocks away. 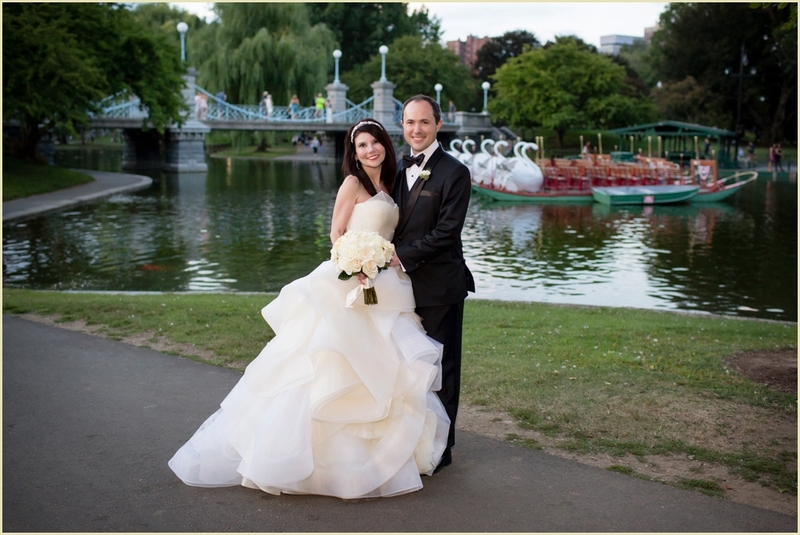 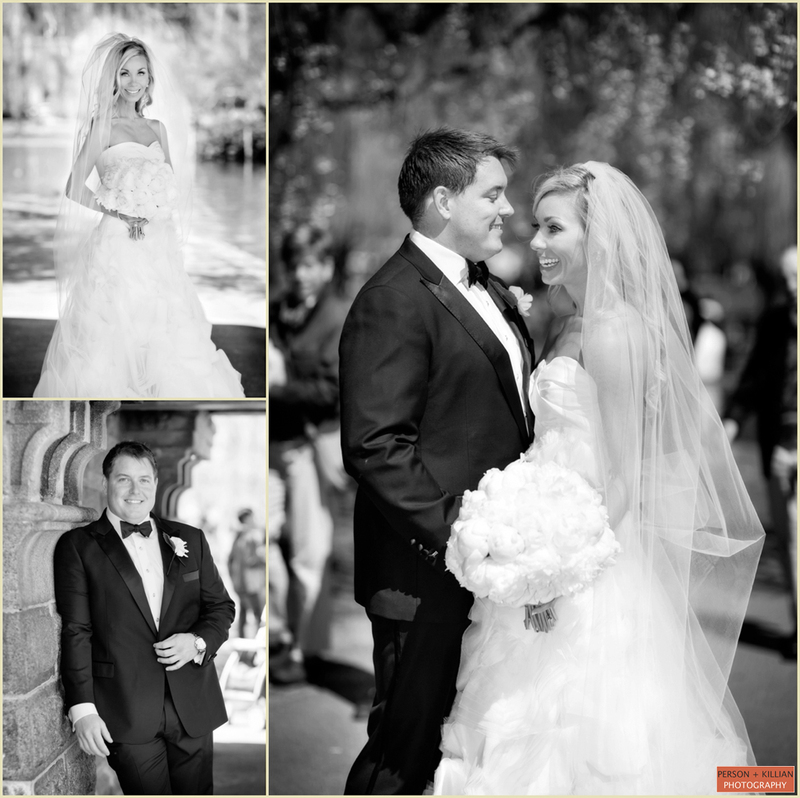 The afternoon wedding ceremony took place at the Old South Church in Boston’s Copley Square. 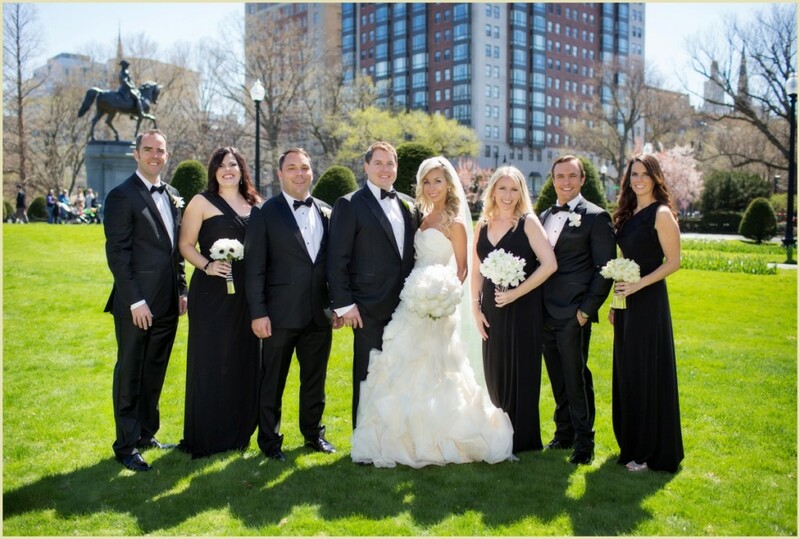 After the “I do”s, we headed back to the Taj Boston with the newlyweds and their wedding party for some formal photos in the hotel. 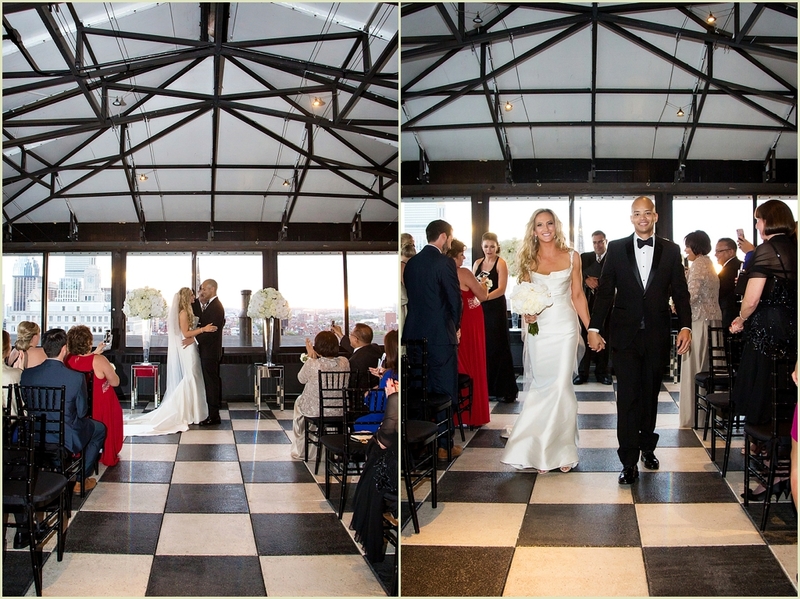 While guests waited for the evening reception to begin, Sarah and Sam arranged a trolley tour to show them all the sights of the city! 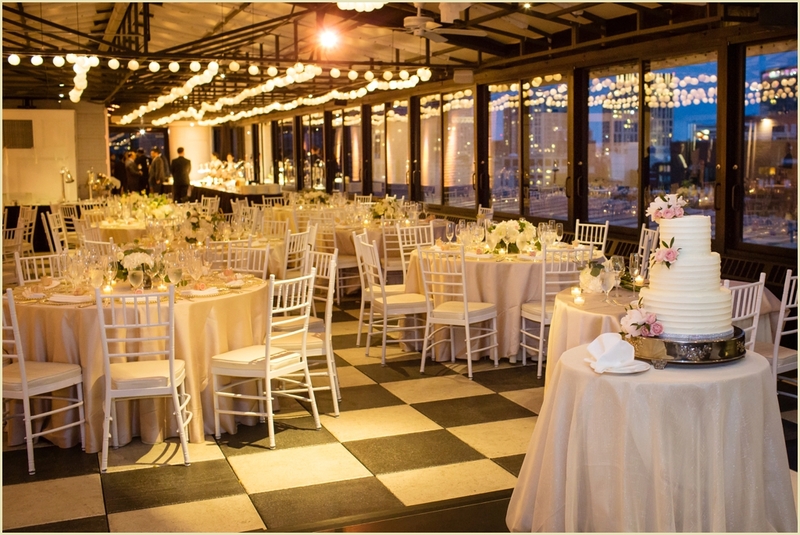 Both the cocktail hour and the reception were held on the beautiful Taj Rooftop. 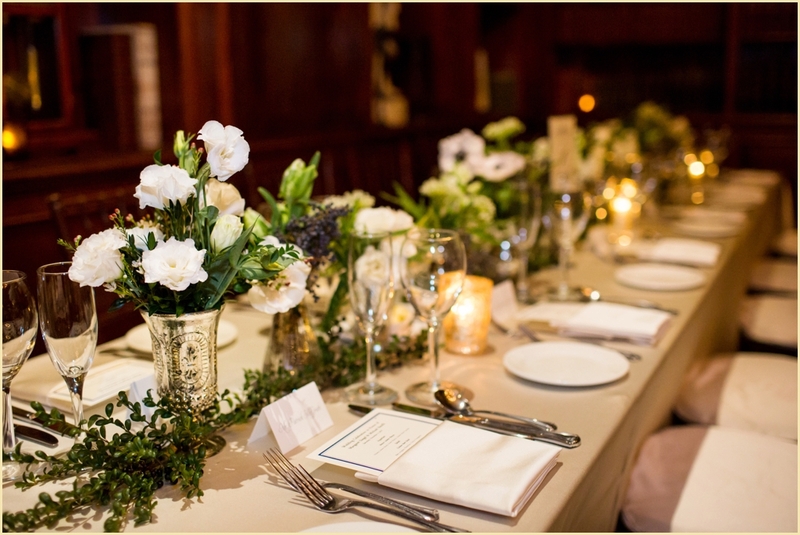 The couple chose simple, neutral colors for their decor paired with classic green and white floral centerpieces on each table. 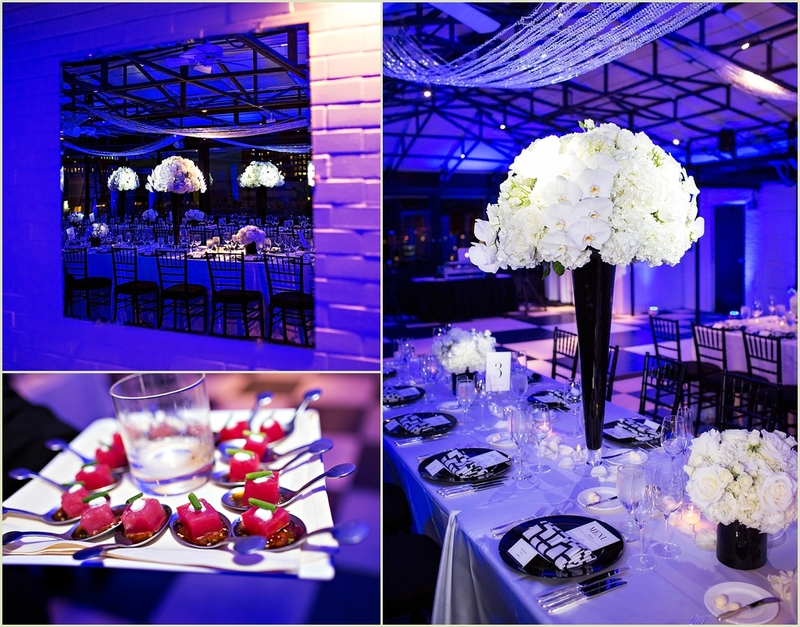 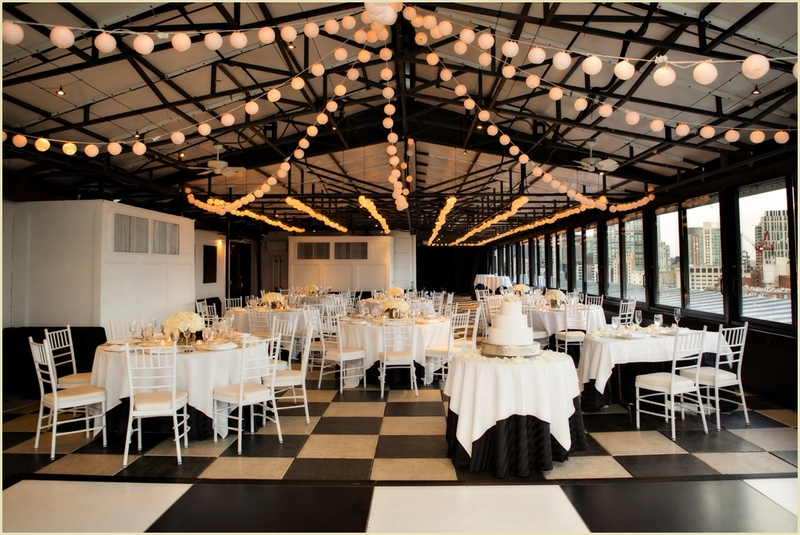 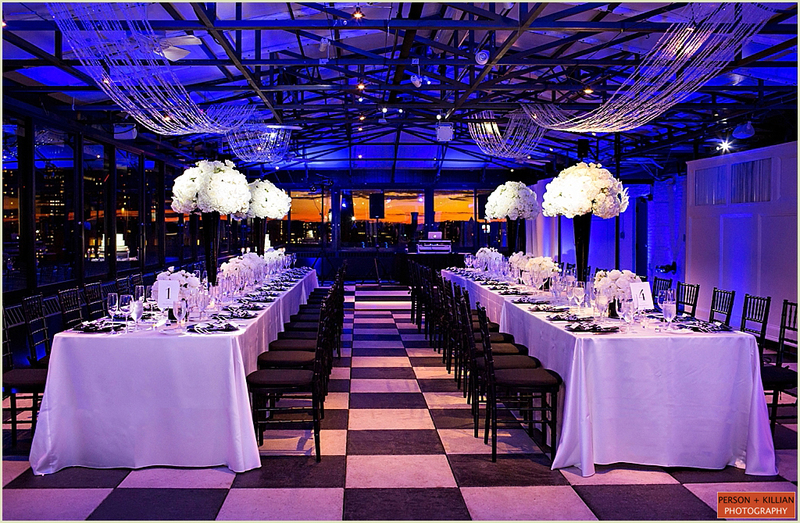 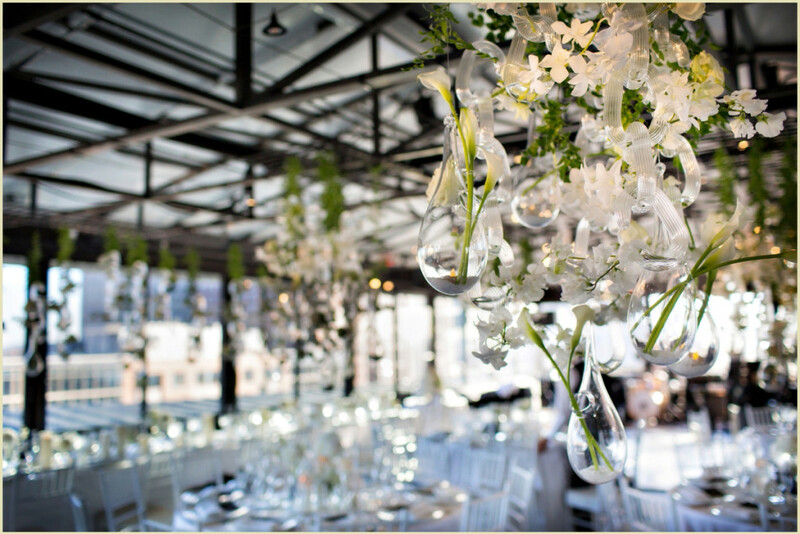 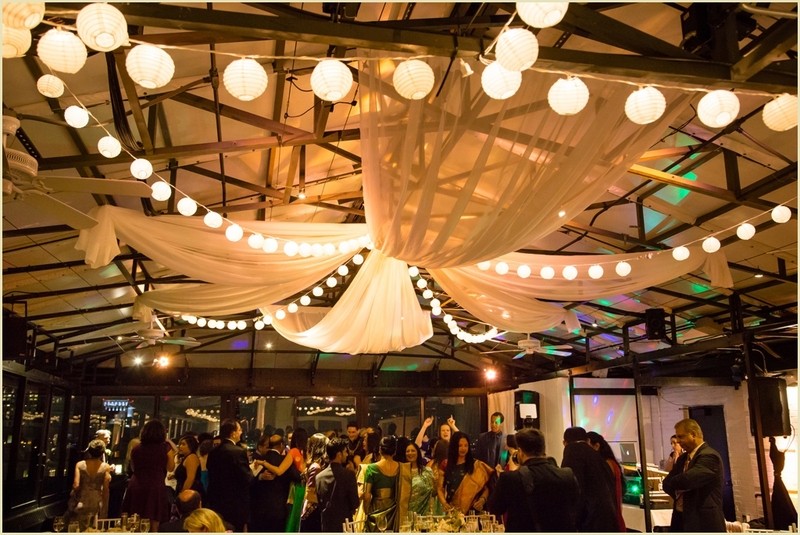 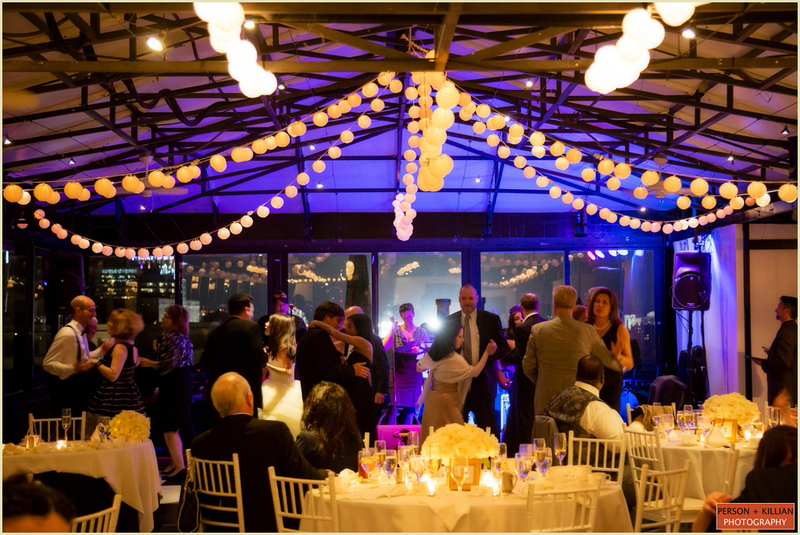 The Taj Rooftop ceiling was decorated with natural greenery and hanging crystal orbs right over the dance floor, for a beautiful pop of color. 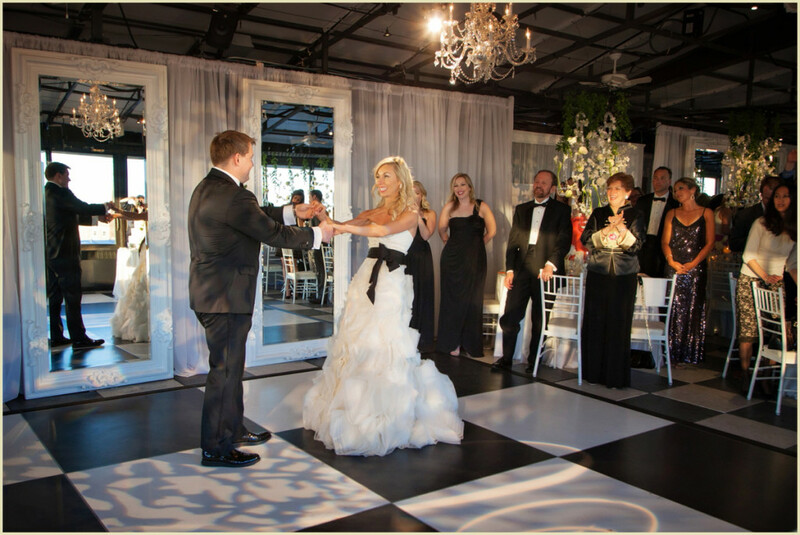 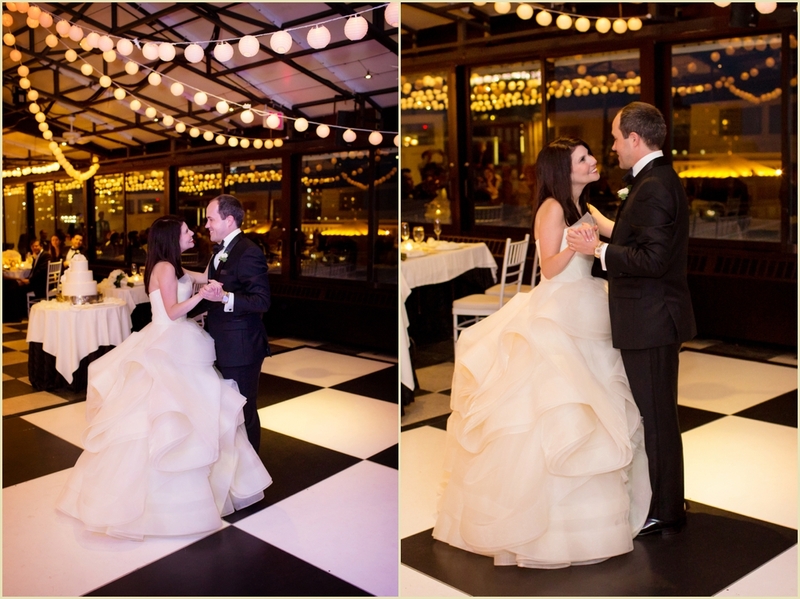 Guests ate, drank, and danced the night away as they celebrated this wonderful couple. 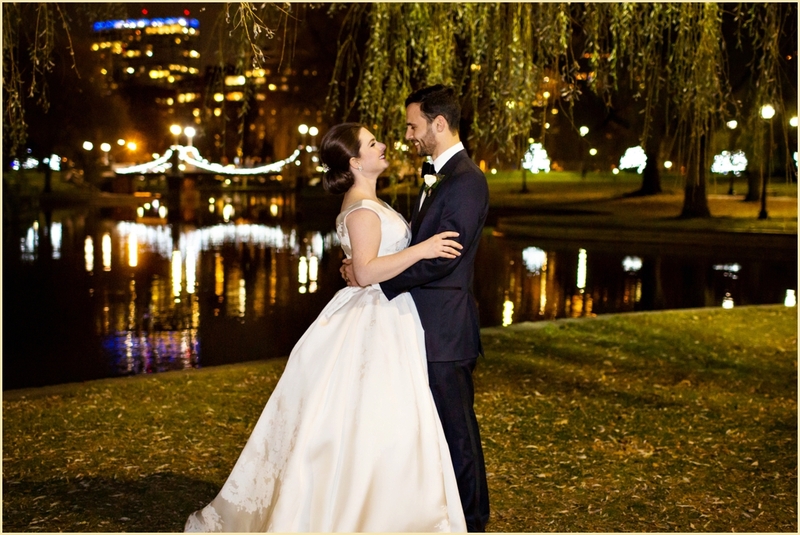 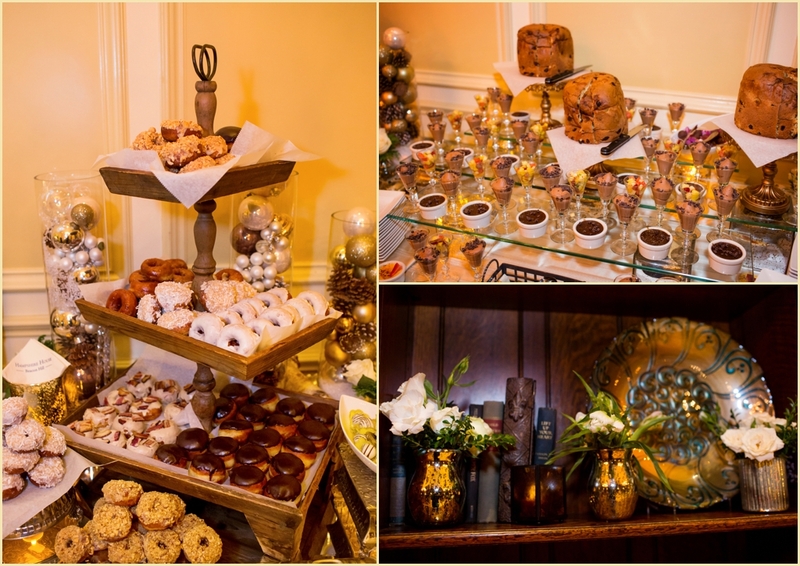 Thank you Sarah and Sam for including us in your Taj Boston wedding day, and a special thanks to Marrero Events and the whole team at the Taj for another spectacular event! 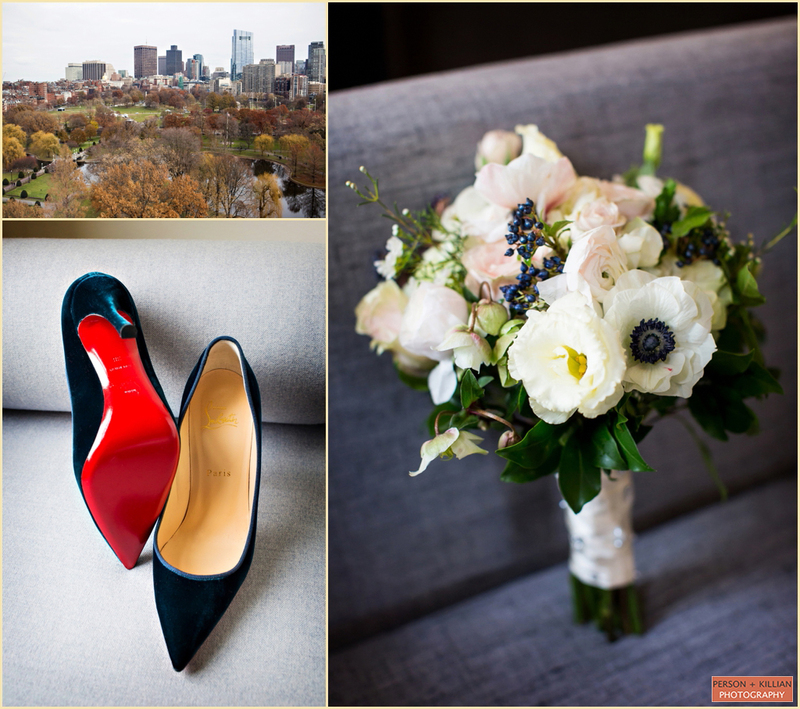 A gorgeous day and classic Back Bay location made for the perfect combination for Melissa + Peter’s Spring Taj Boston wedding. 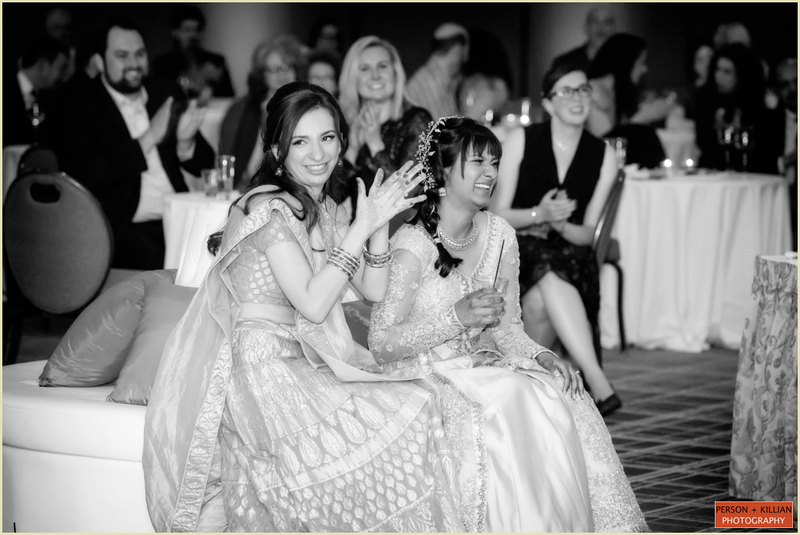 The bride and groom wanted a classic and traditional wedding throughout all the aspects of their big day, from the soft flowers, to the beautiful Church ceremony (which held extra special significance to Melissa), to the evening reception in the elegant Taj Boston Grand Ballroom. 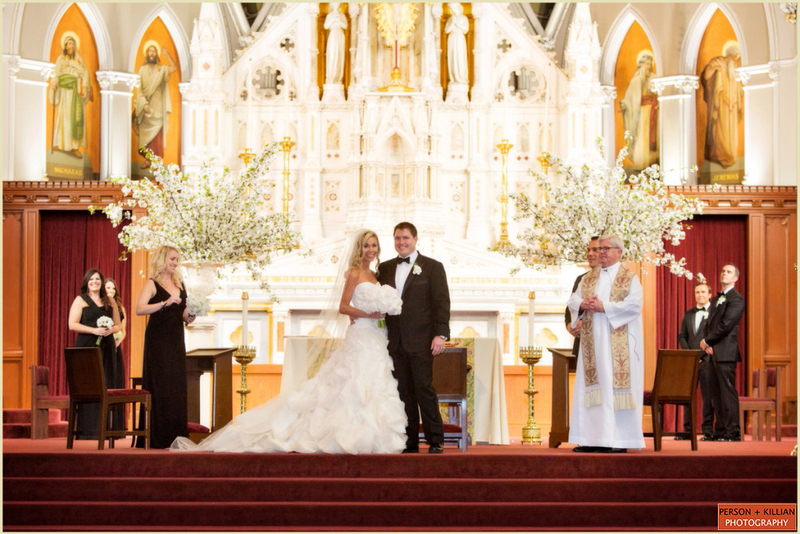 The wedding ceremony was held at the Collage of the Holy Cross, St. Joseph Chapel, which is were Melissa went to school. 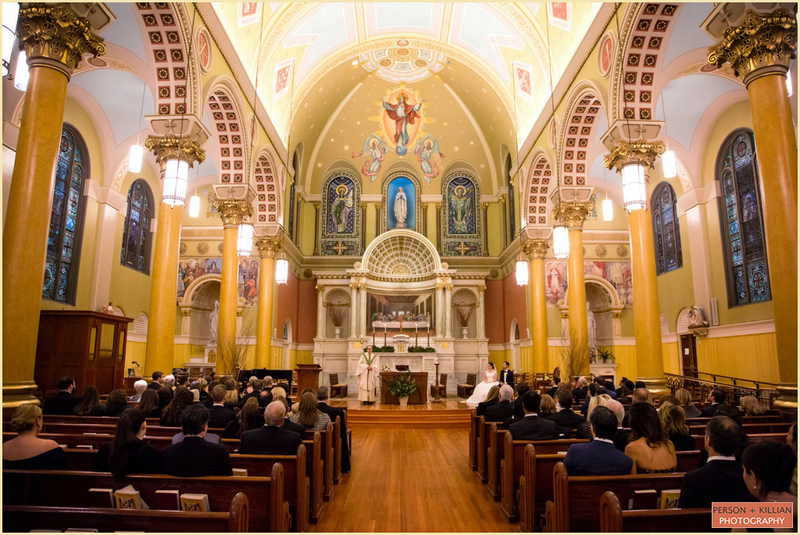 The inside of the church was stunning, with a high domed ceiling and lots of colorful stained glass for a warm, intimate feeling. 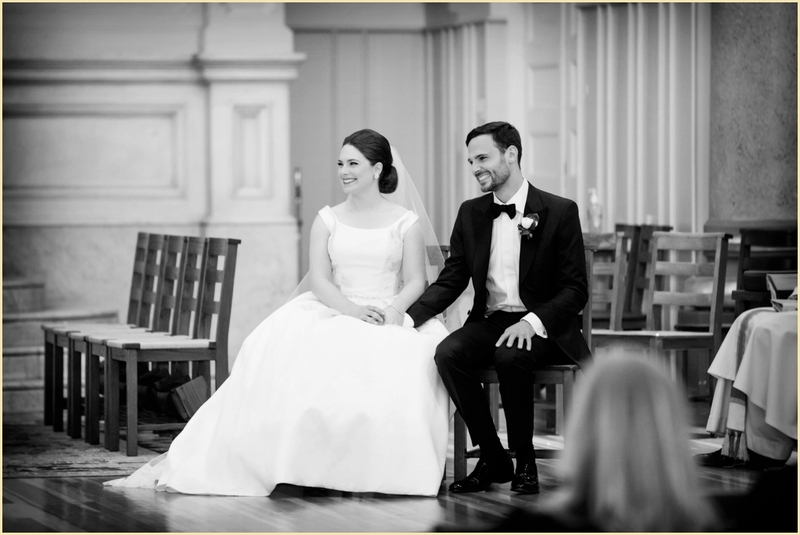 This beautiful catholic ceremony was filled with amazing music and the service was one of the most important elements to the evening for Melissa + Peter. 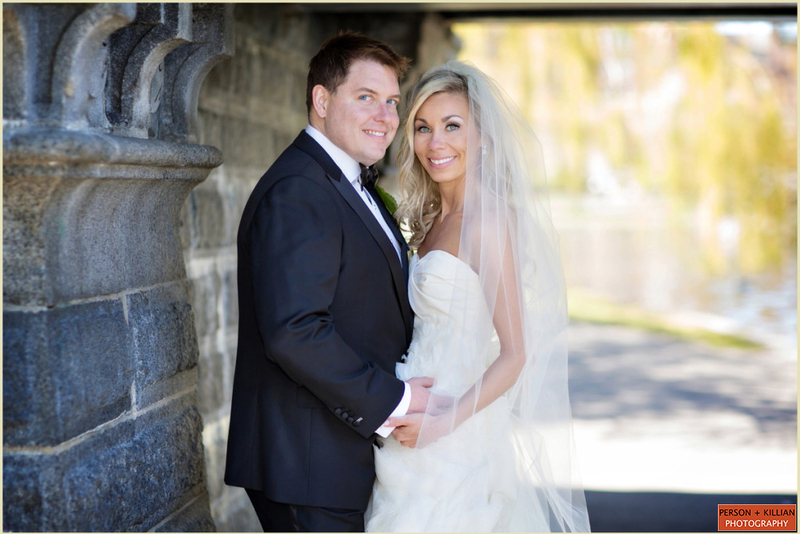 Coming out of the church after the “I do”s, the Spring weather was absolutely perfect. 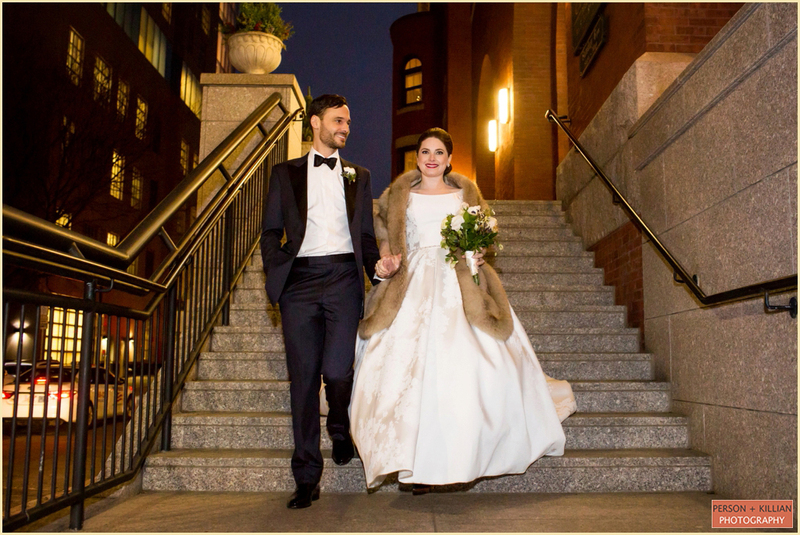 We couldn’t help but take a few photographs of the happy newlyweds on the steps of the chapel, before heading back to Boston. 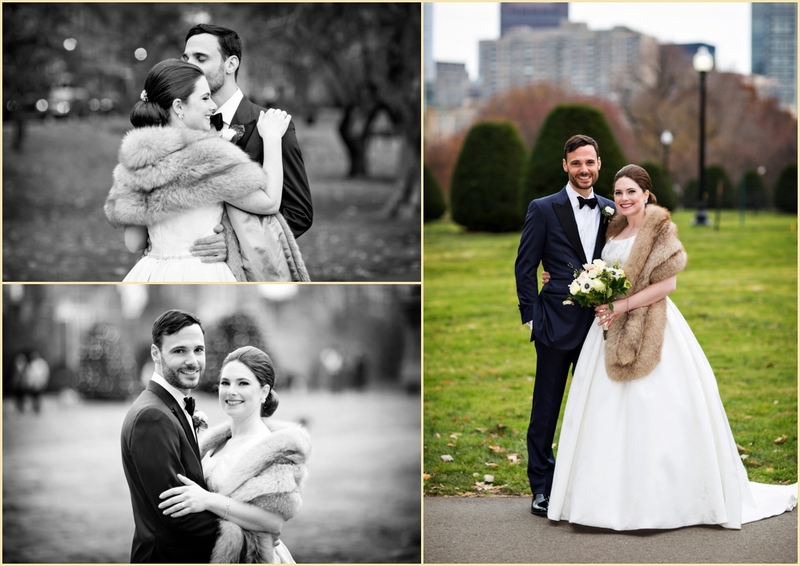 While guests enjoyed cocktail hour we took Melissa, Peter, and their wedding party over to the Boston Public Garden for some beautiful formals photographs. 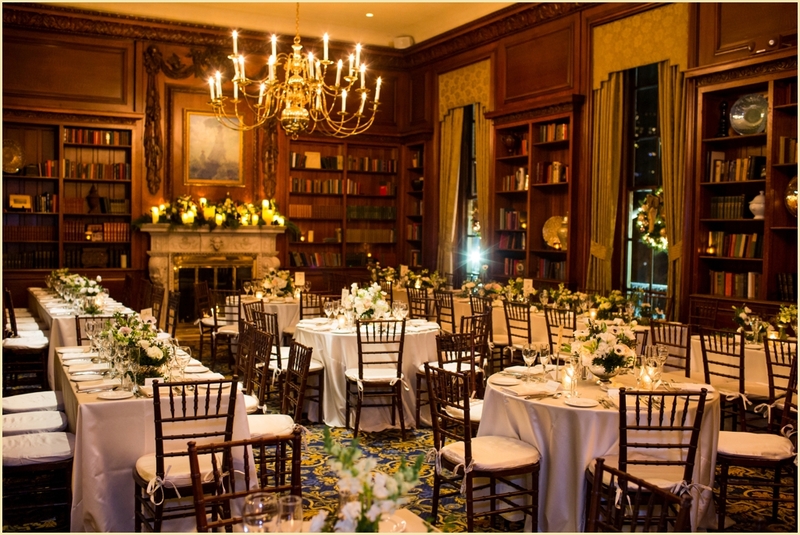 The Ballroom was transformed into the classically elegant wedding reception Melissa had been dreaming of, with textured linens and gorgeous floral arrangements. The space was filled with rich, warm color, so the soft ivory flowers, and touches of gold were the perfect choice to enhance the natural elegance of the space without overwhelming it. 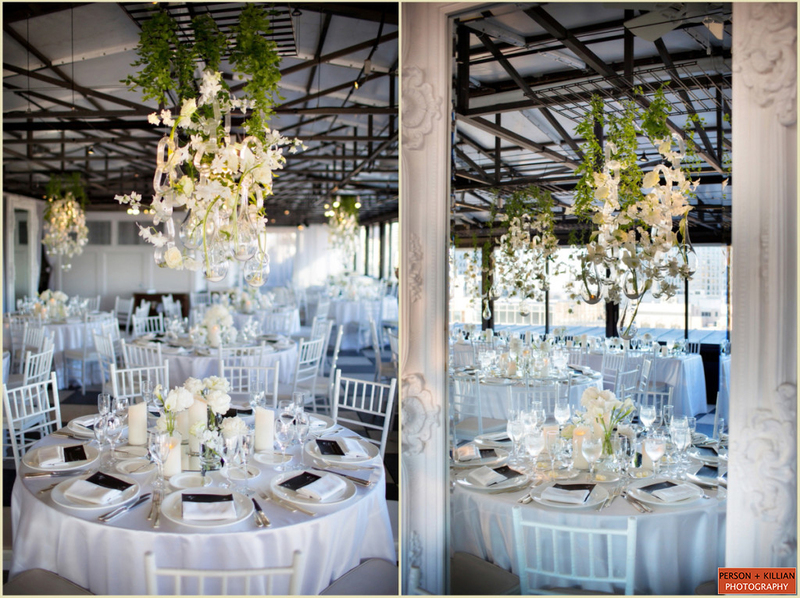 Both the high and low floral arrangements were paired with candle votives, giving the room a warm romantic glow as soon as the sun started to set. 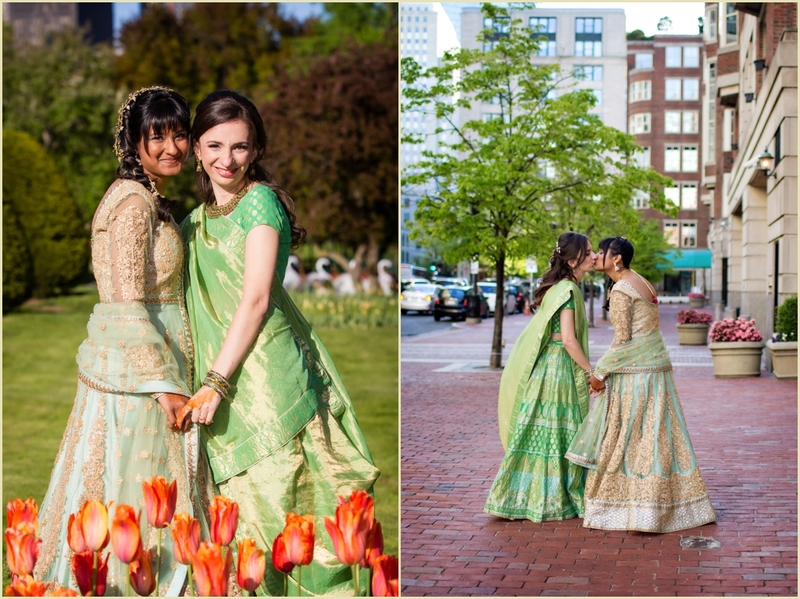 Thank you to the Taj Boston for being so lovely to work with and a big congratulations and thank you to Melissa + Peter for having us there to capture your beautiful Spring Taj Boston wedding celebration! 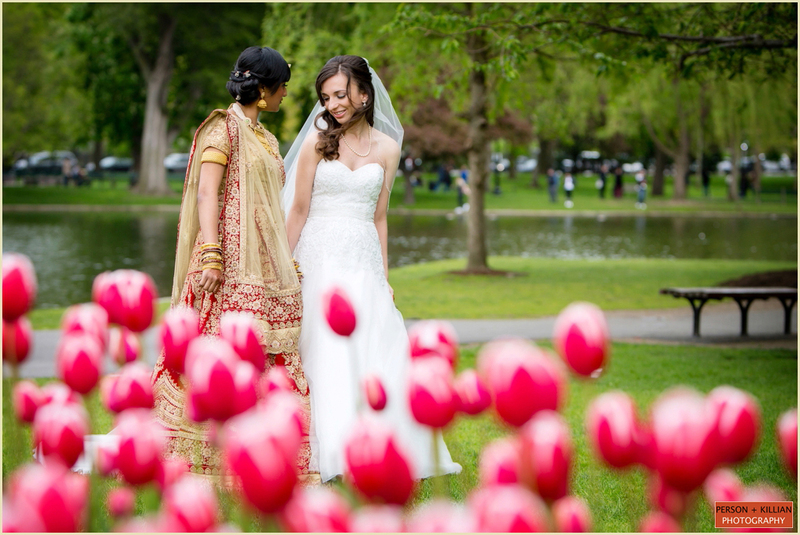 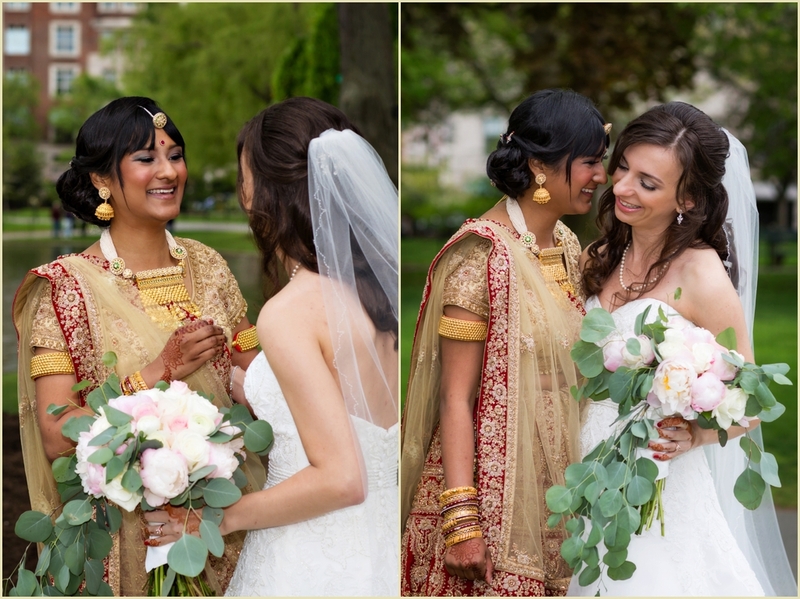 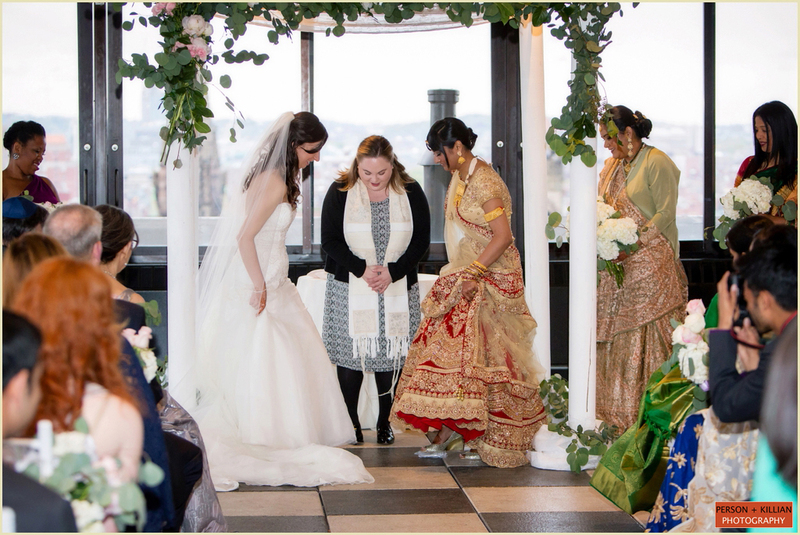 This post is filed under Spring Taj Boston Wedding and was photographed by Lauren Killian of Person + Killian Photography. 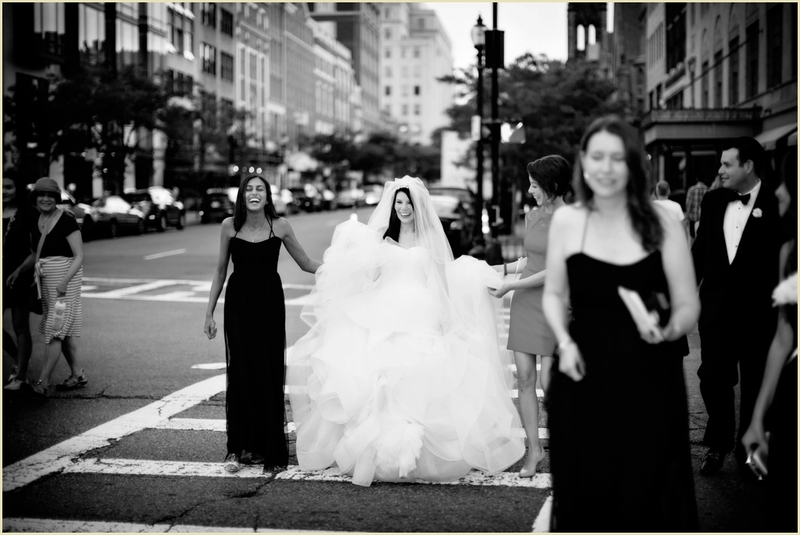 Lauren can be reached directly through her site: www.personKillian.com or via email: [email protected] Person + Killian Photography is a Boston based photography studio and is located at 251 Newbury Street. 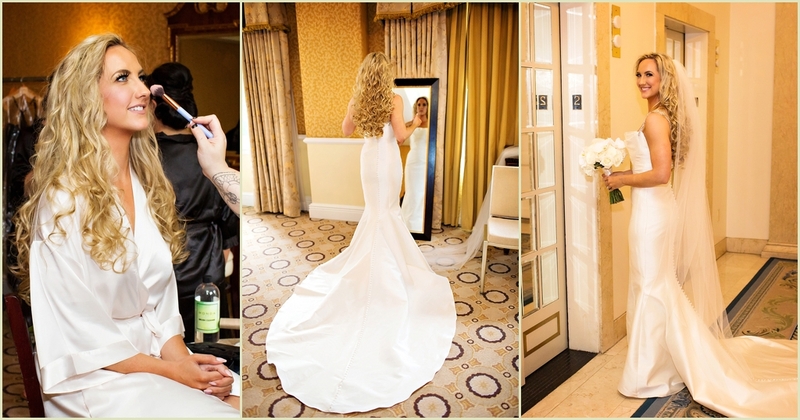 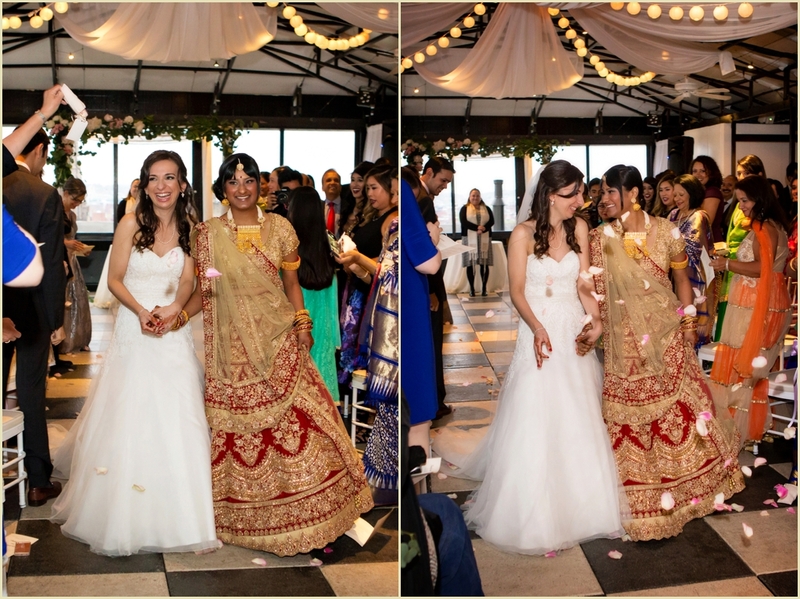 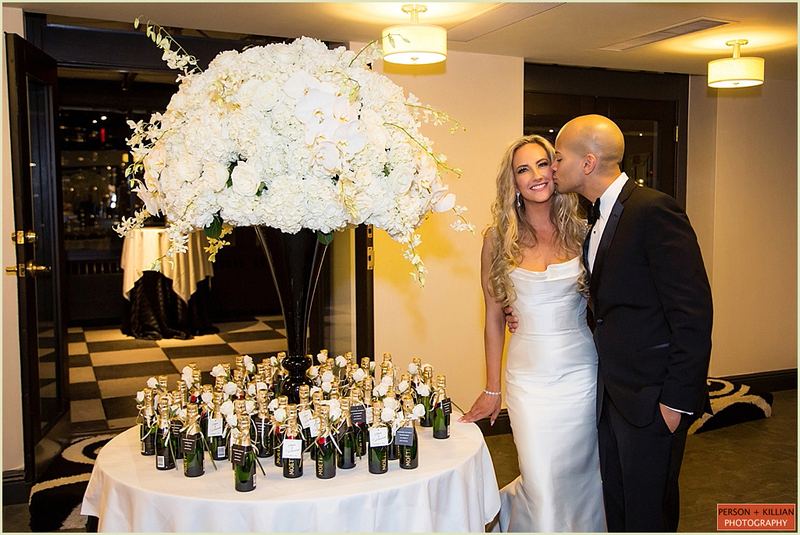 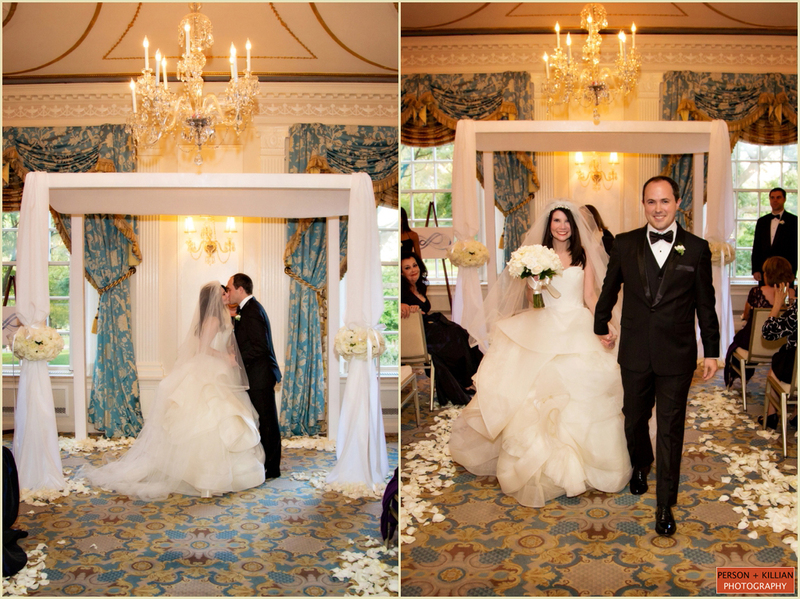 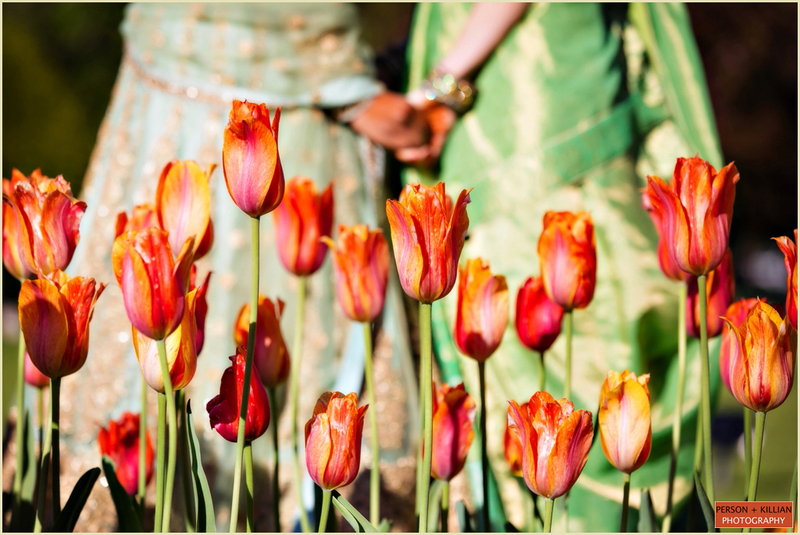 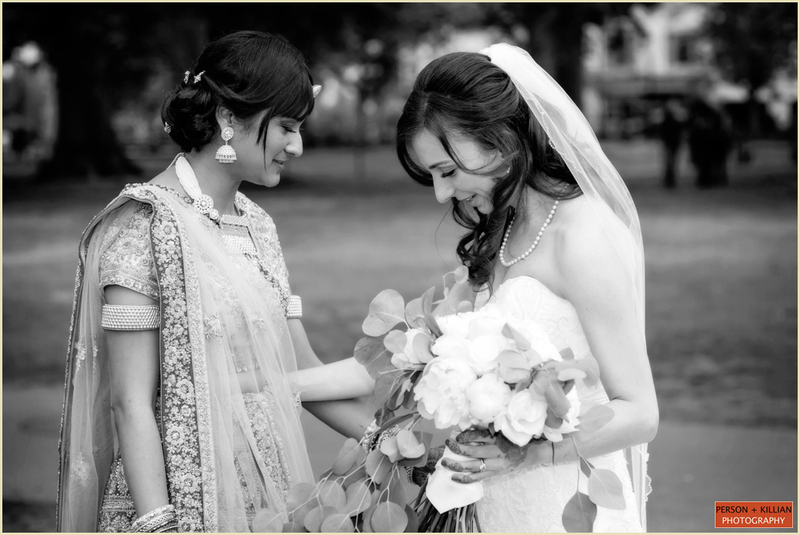 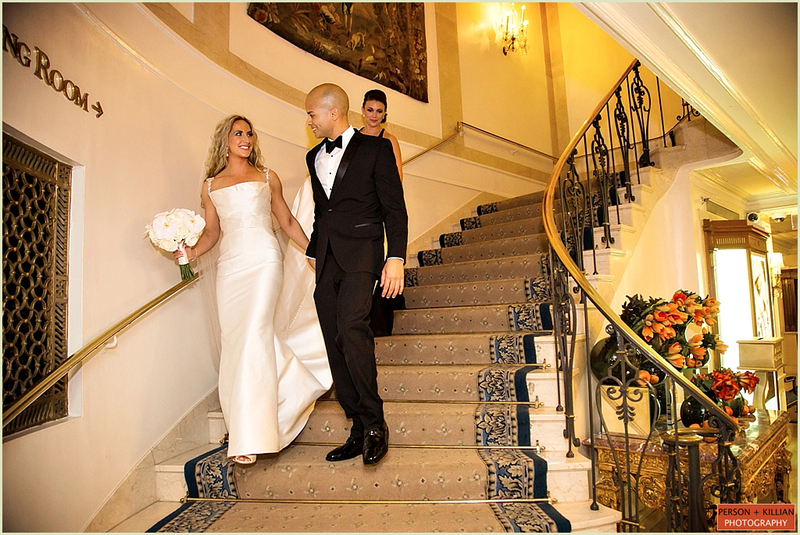 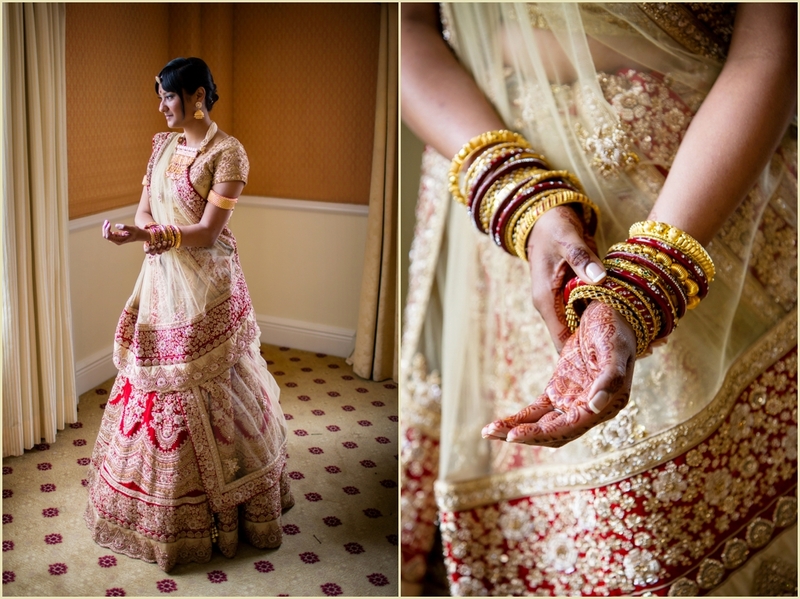 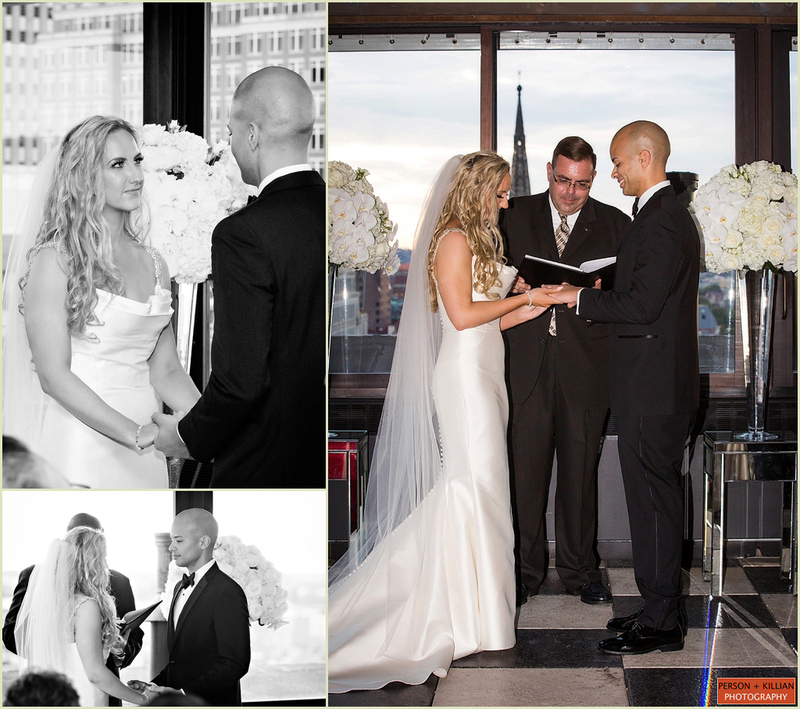 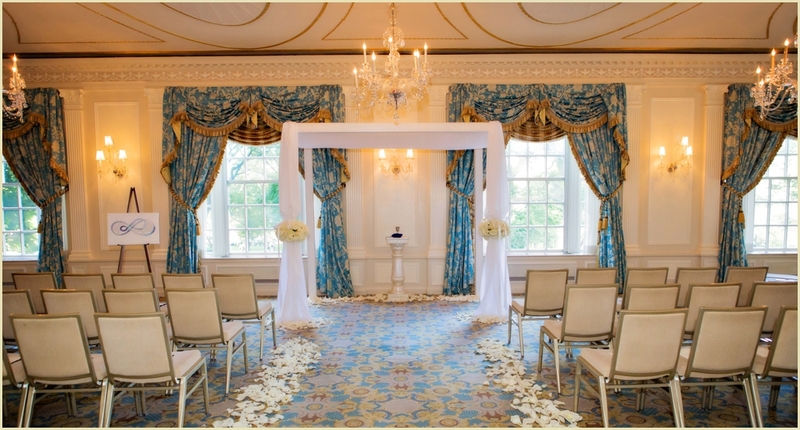 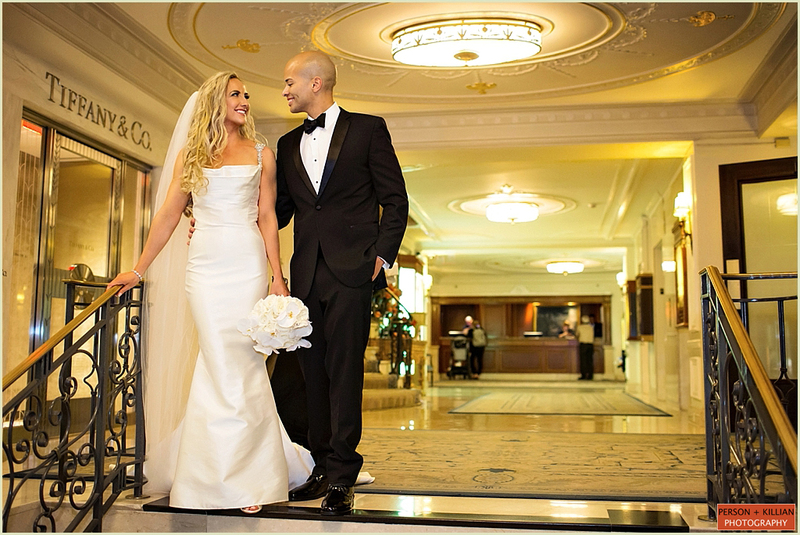 To see more images of Taj Boston Weddings, please, click here. 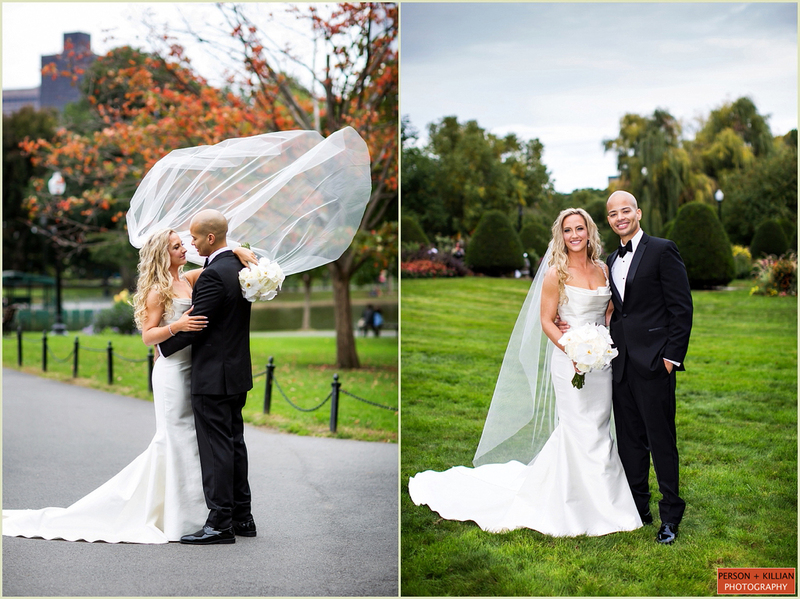 It was the first day of Fall, and Caroline + Drew could not have asked for a more perfect day for their Taj Boston Wedding. 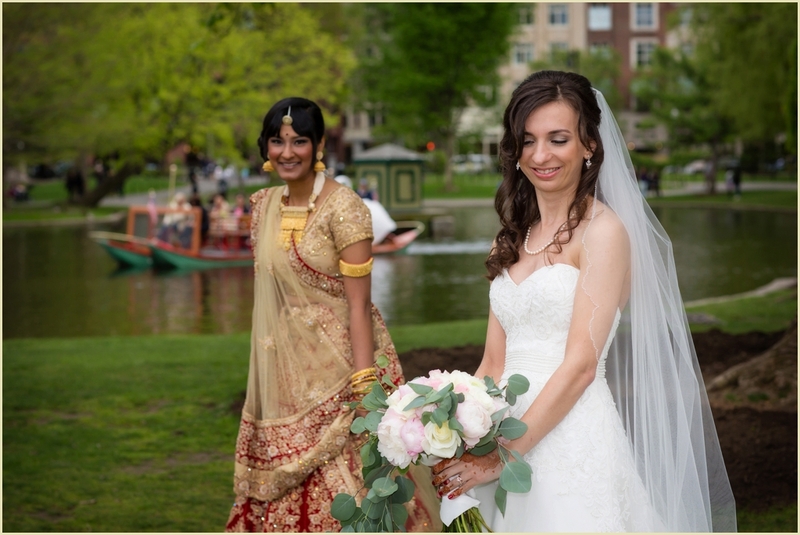 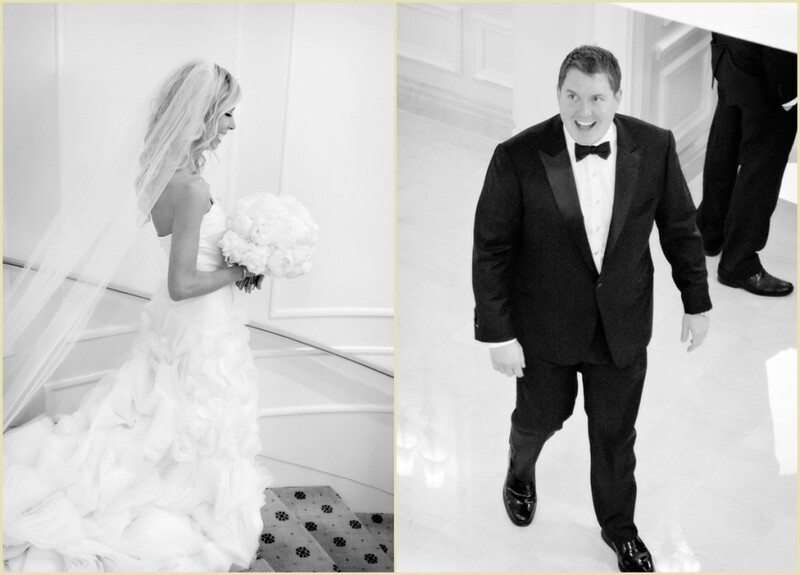 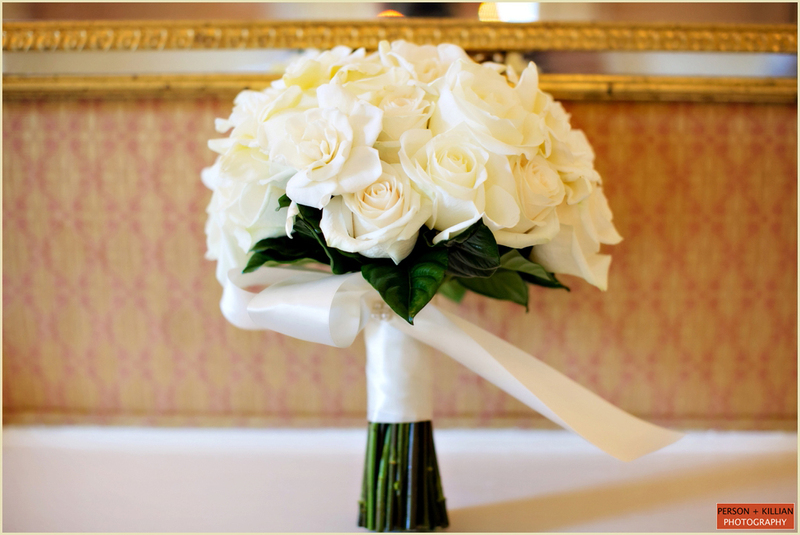 The bride and groom wanted a classic and traditional wedding throughout all the aspects of their big day, from the soft white flowers, to the beautiful Church ceremony (which held extra special significance to Caroline), to the evening reception in the elegant Taj Boston Grand Ballroom. 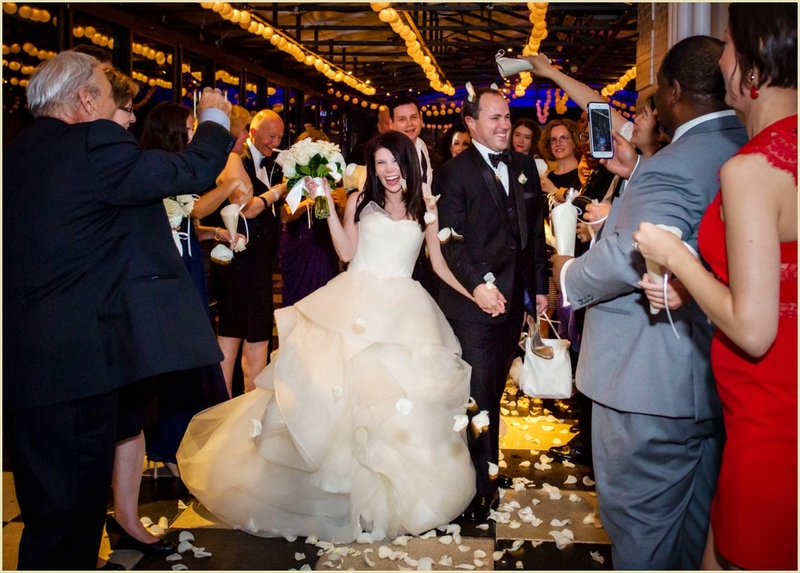 Caroline + Drew both love the color navy, so they decided to accent Caroline’s strapless white wedding dress and bouquets of white roses with deep navy blue dresses for the bridesmaids. 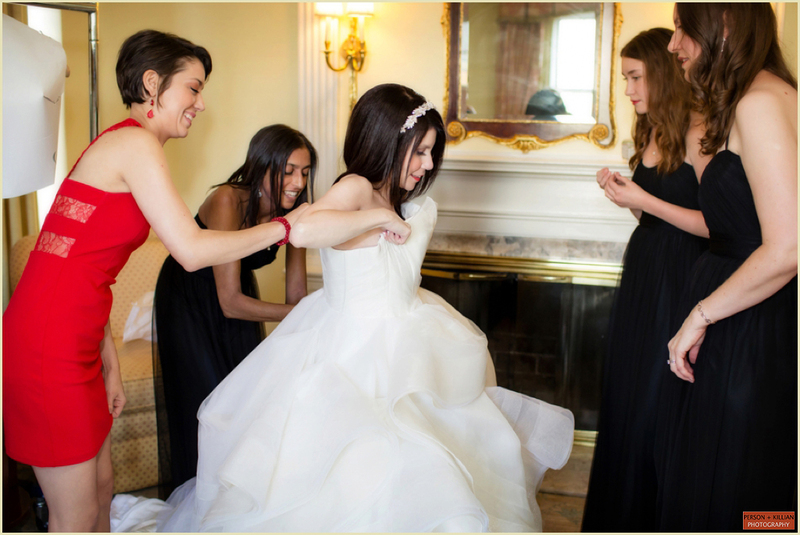 The flower girls’ ruffled white dresses matched the bride’s gown perfectly, with a classic blue sash around each one. 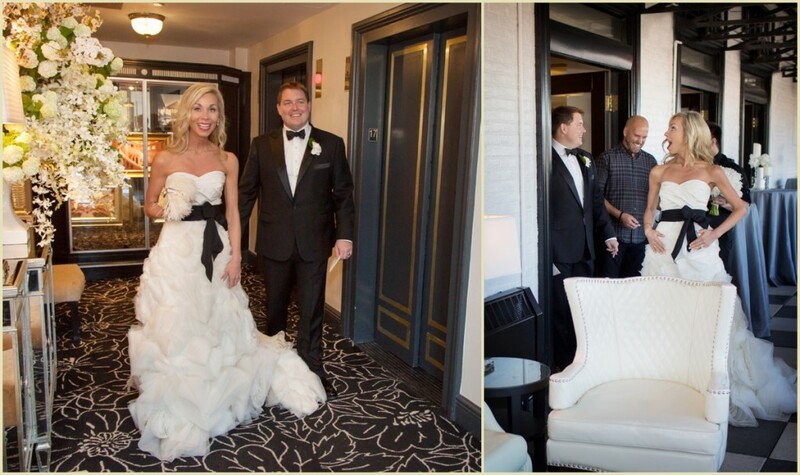 Drew and the rest of the wedding party travelled to the church in a white wedding trolley, while Caroline and her father followed behind in a white limousine. 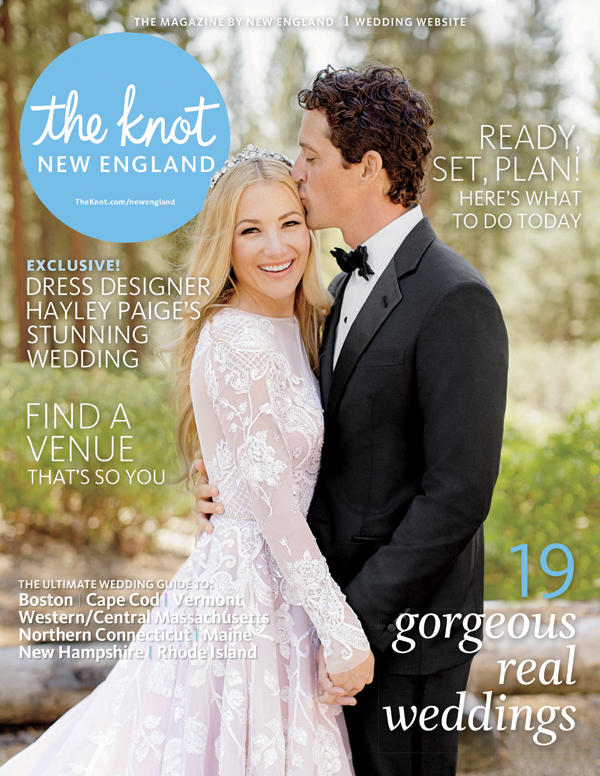 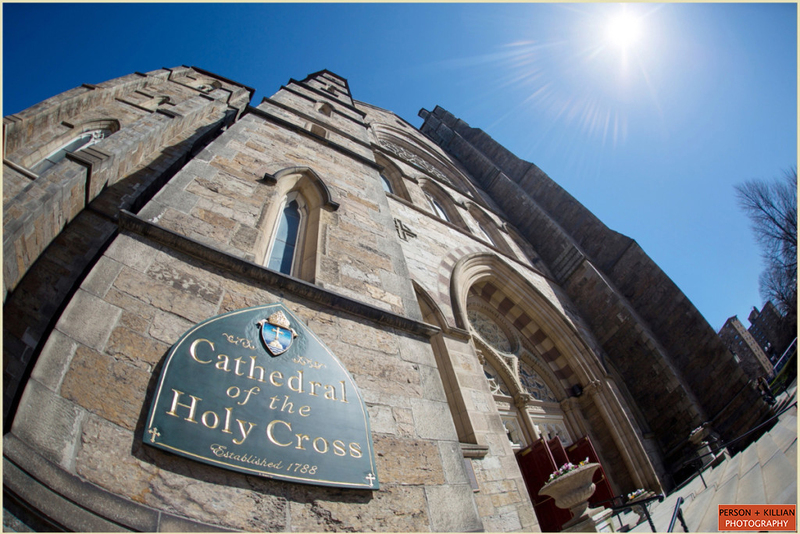 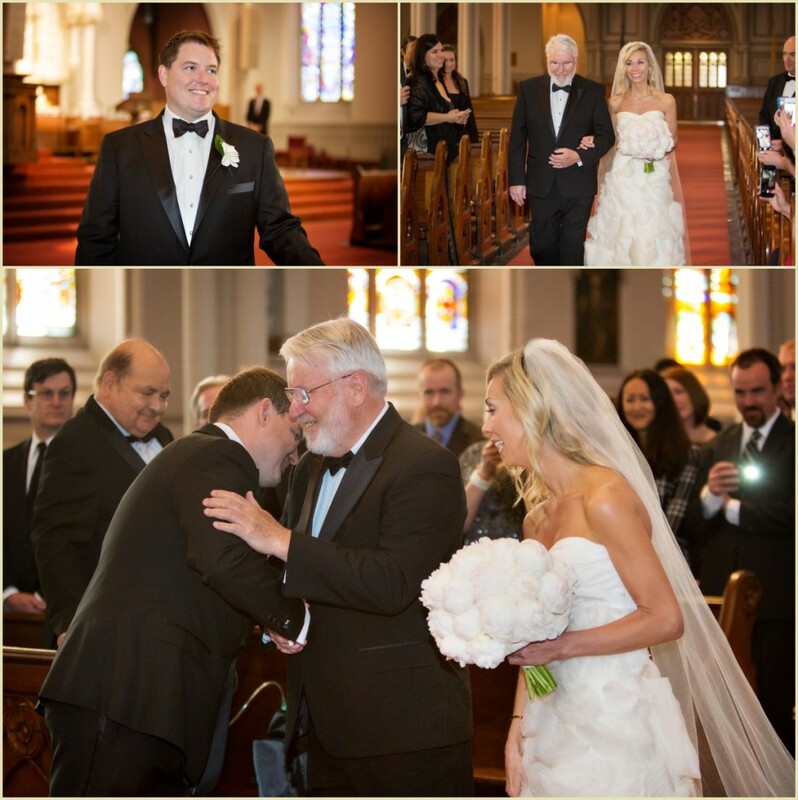 The wedding ceremony was held at the Holy Name Parish in West Roxbury, which is the very same church that Caroline’s mother and father got married in years earlier. 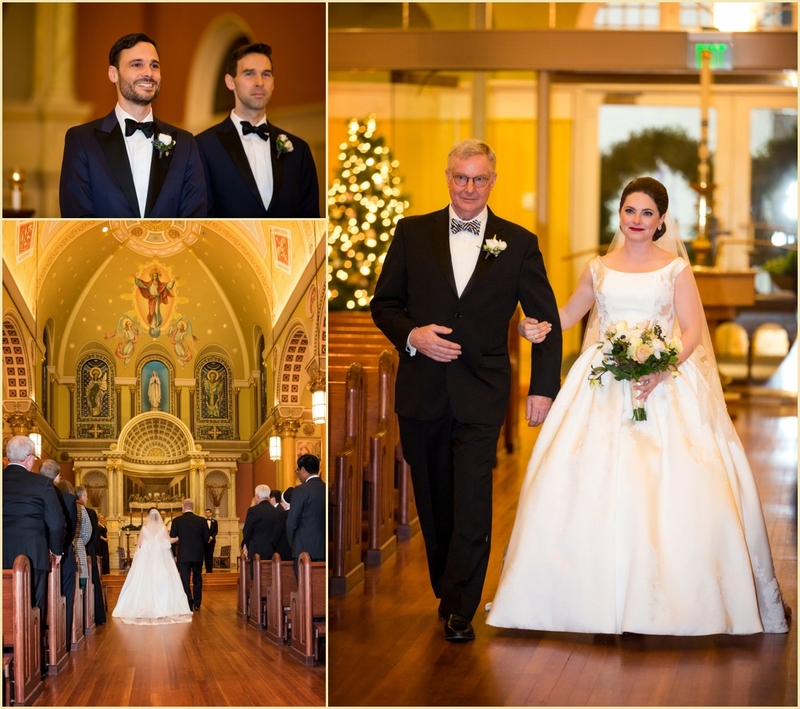 The inside of the church was stunning, with a high domed ceiling and lots of colorful stained glass for a warm, intimate feeling. 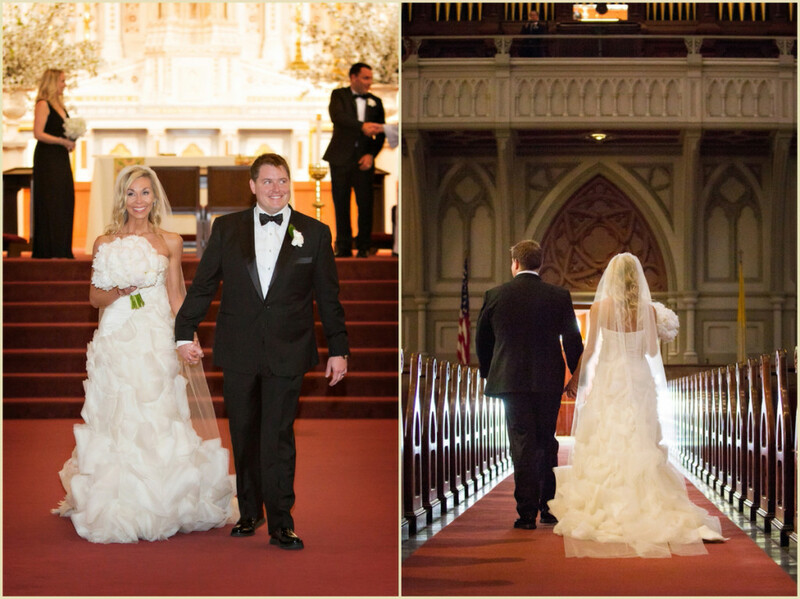 Caroline + Drew chose simple white flower accents leading down the aisle, to enhance the natural beauty and color of the church itself. 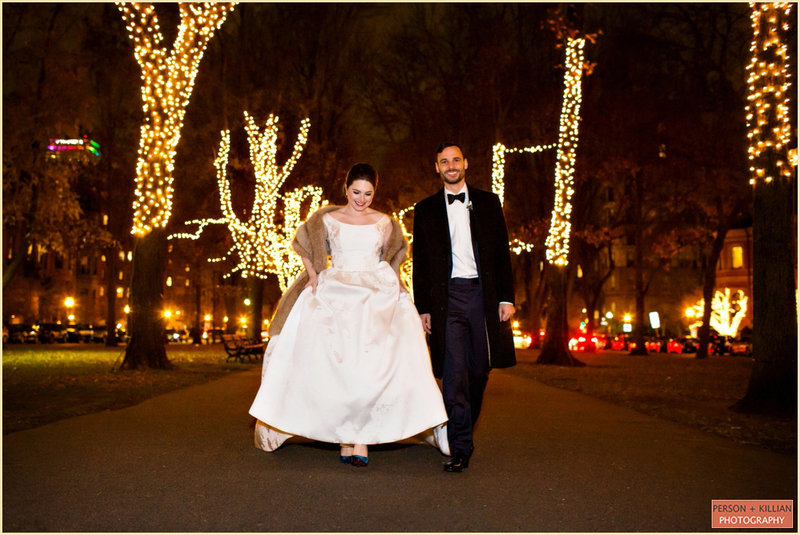 Coming out of the church after the big “I do”s, the Fall afternoon weather was absolutely picture-perfect. 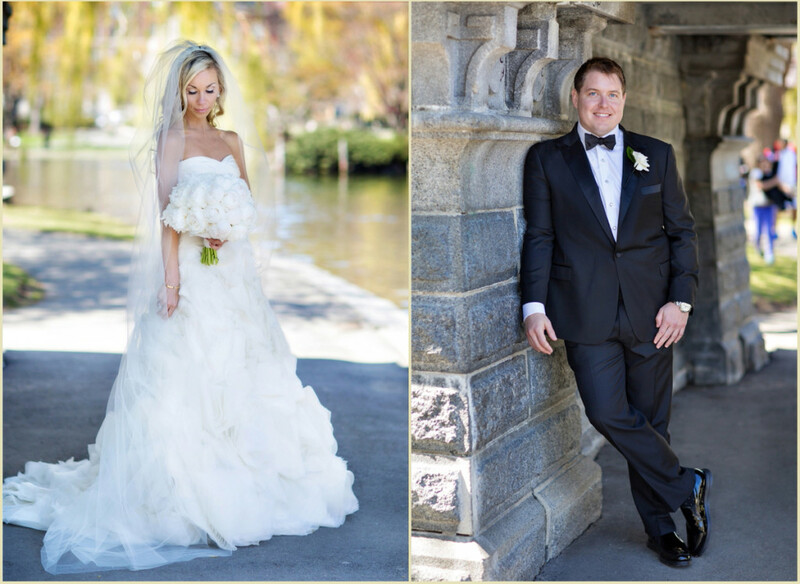 We couldn’t help but snap a few photos of the happy newlyweds on the steps of the Parish, with beautiful puffy clouds filling the sunny blue sky behind them! 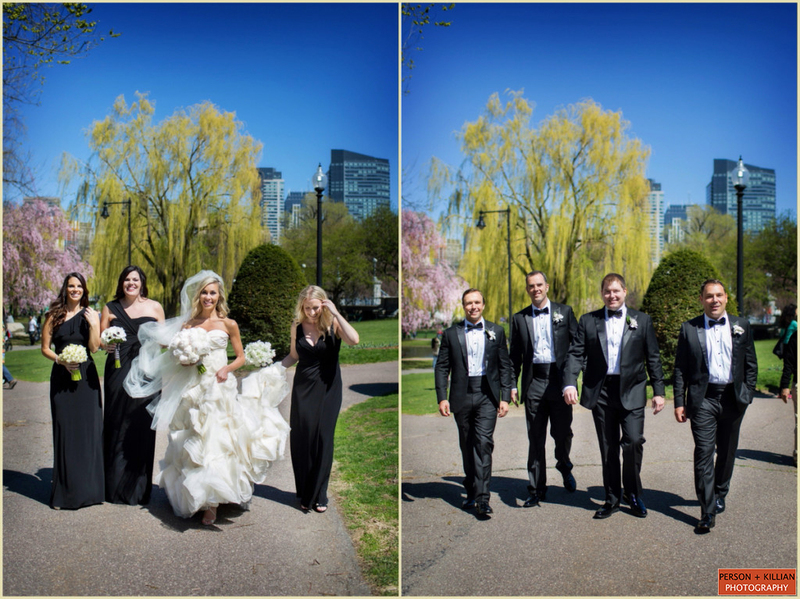 Before heading back to the Taj Boston for the reception, we took Caroline, Drew, and their wedding party into the Boston Public Garden for some outdoor wedding formals in the sunshine. 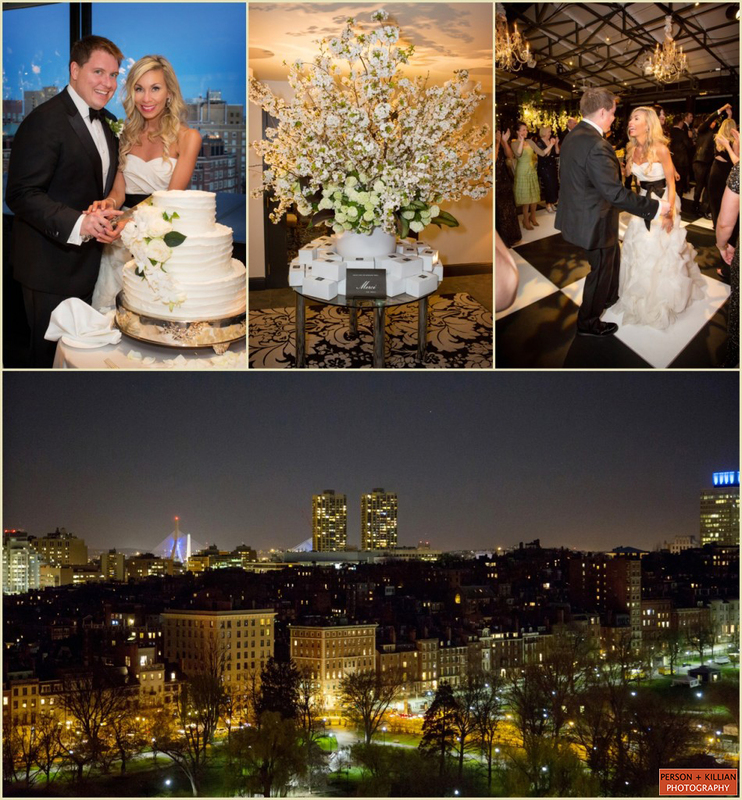 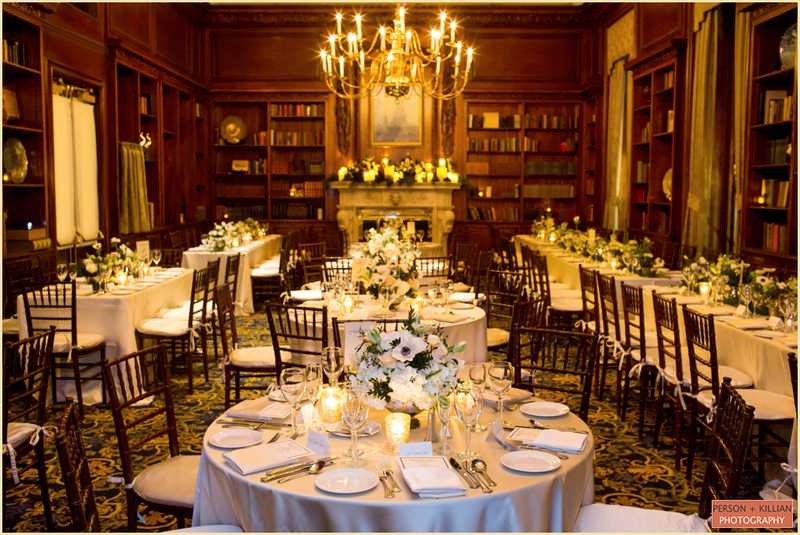 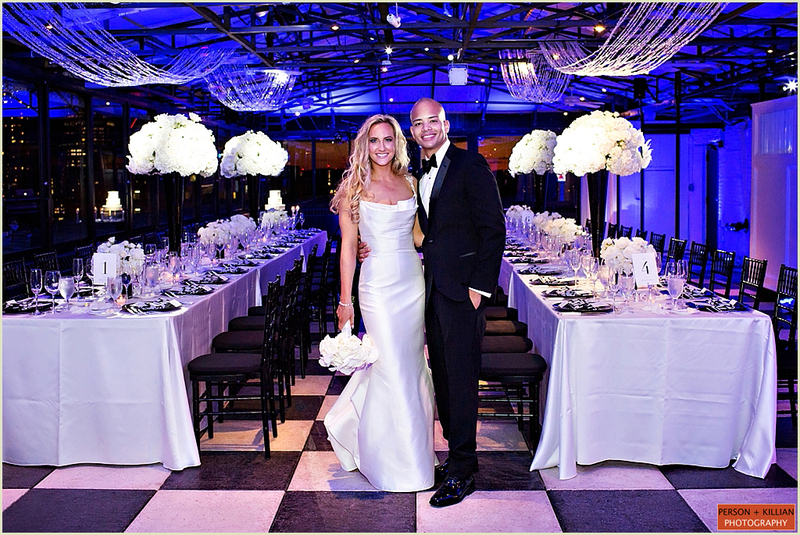 The Taj Boston Grand Ballroom was transformed into the traditional and elegant wedding reception Caroline + Drew had been dreaming of, with textured champagne linens and gorgeous table-top floral arrangements from Winston Flowers. 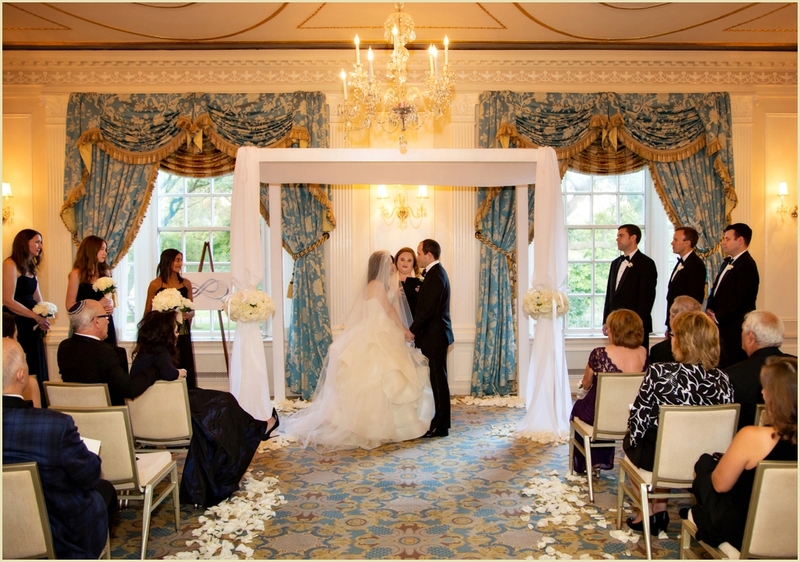 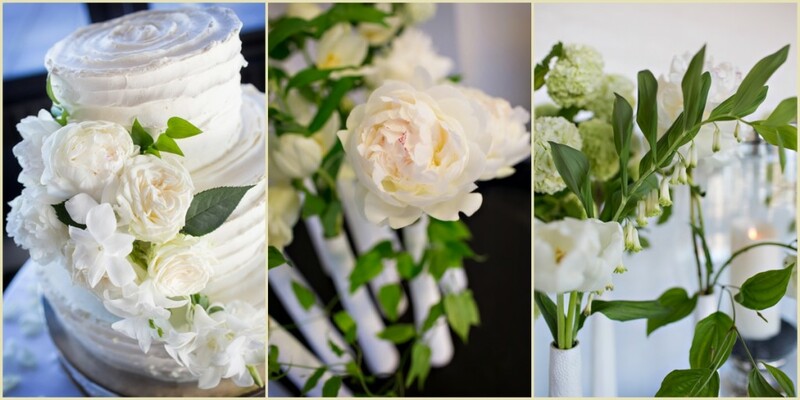 The Grand Ballroom is full of rich, warm color on its own, so the soft white flowers were the perfect choice to enhance the natural elegance of the space without overwhelming it. 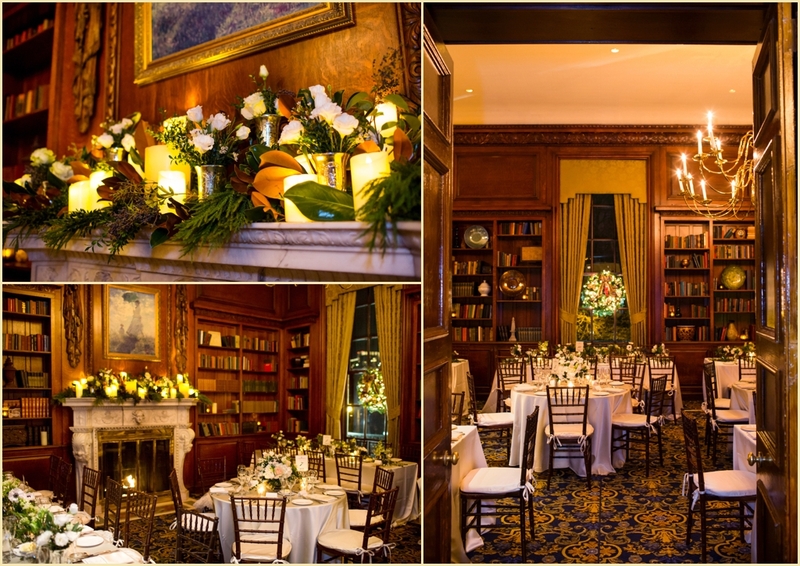 Both the high and low floral arrangements were paired with gold candle votives, giving the room a warm romantic glow as soon as the sun started to set. 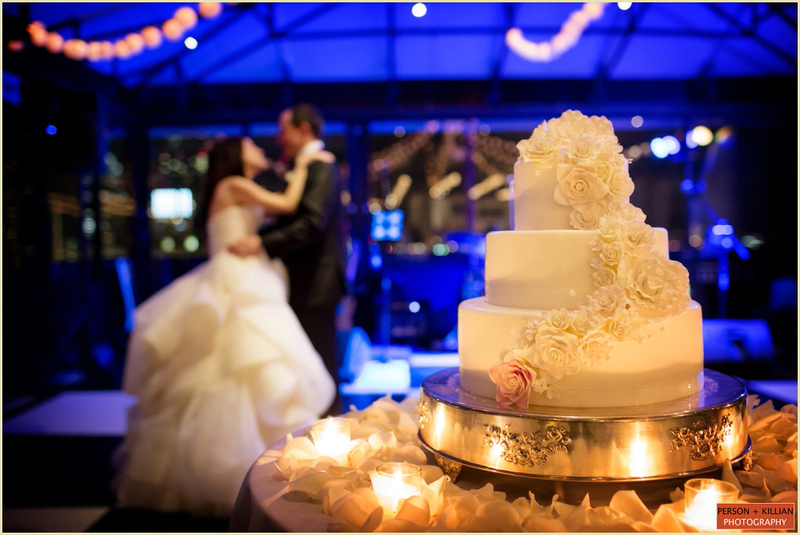 The bride and groom had a lot of fun with their wedding cakes, choosing a traditional navy and white tiered cake AND a special New York Yankees themed baseball cake for their traditional cake cutting! 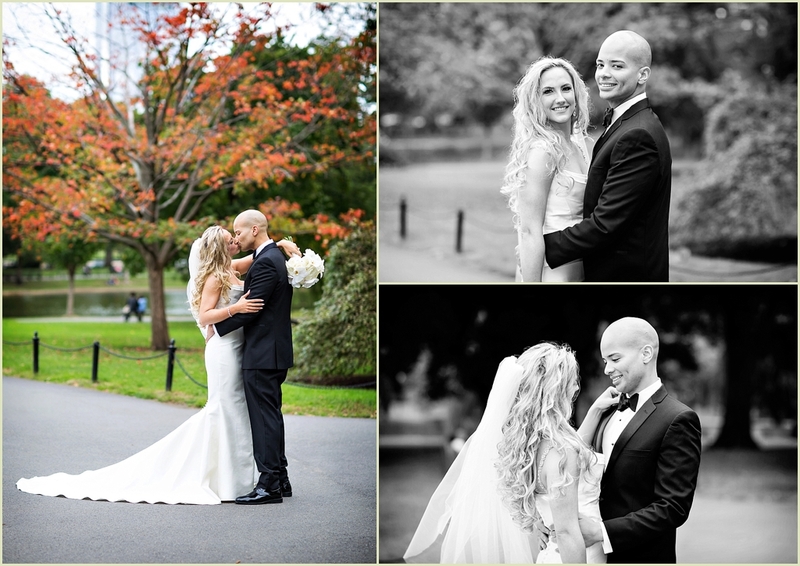 This classic and traditional Taj Boston wedding was the perfect way to kick off the Fall season, and we were so happy to be there to share the day with Caroline + Drew. 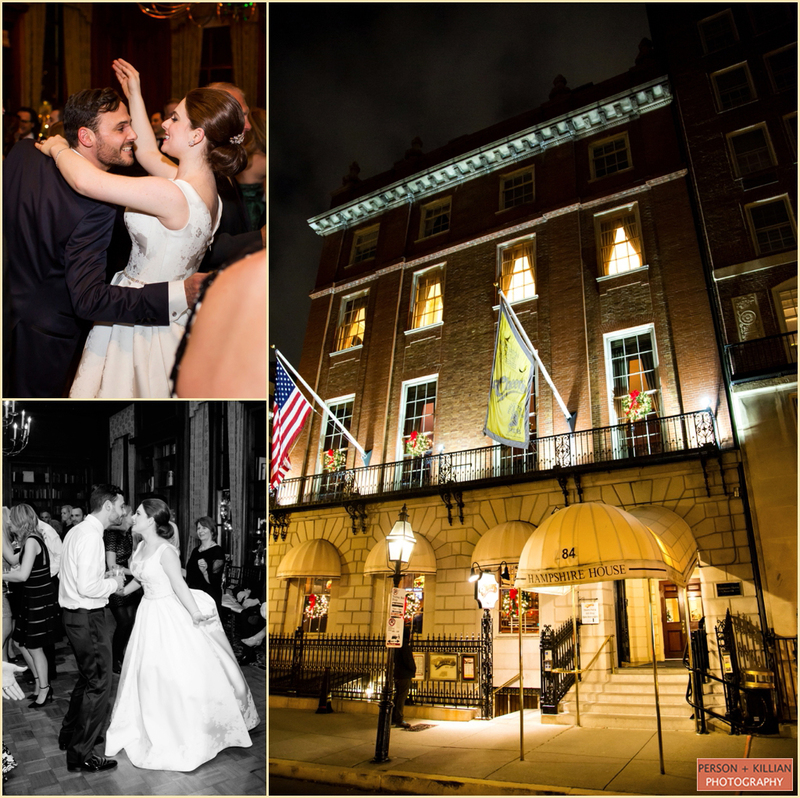 Last weekend, we had the pleasure of photographing the wedding of Melissa and Bill at the beautiful Taj Boston in the city’s Back Bay! 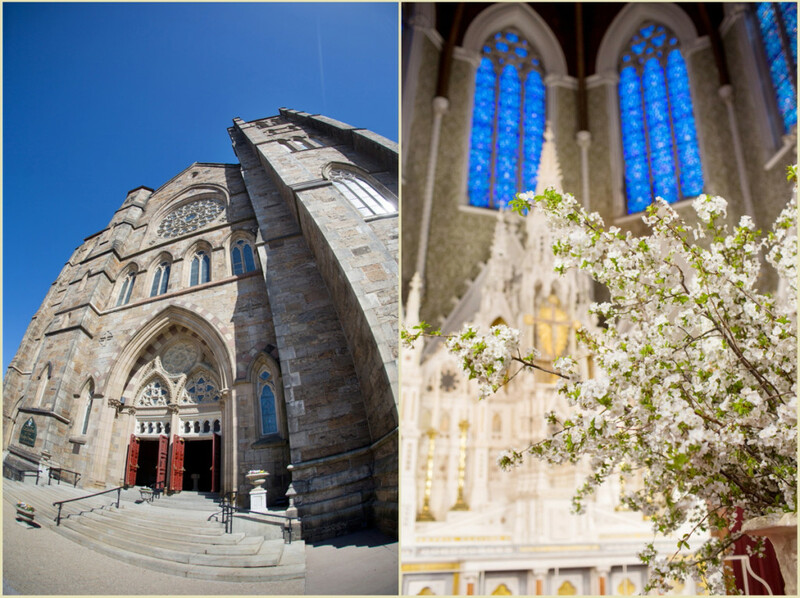 The wedding ceremony took place at the Marsh Chapel, on the campus of Boston University. 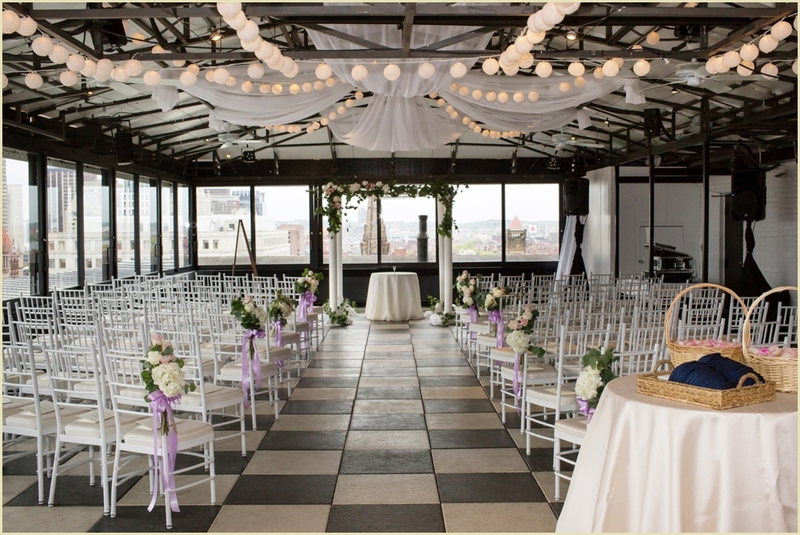 The chapel had special significance to Melissa and Bill as they got engaged in the Chapel’s outdoor courtyard. 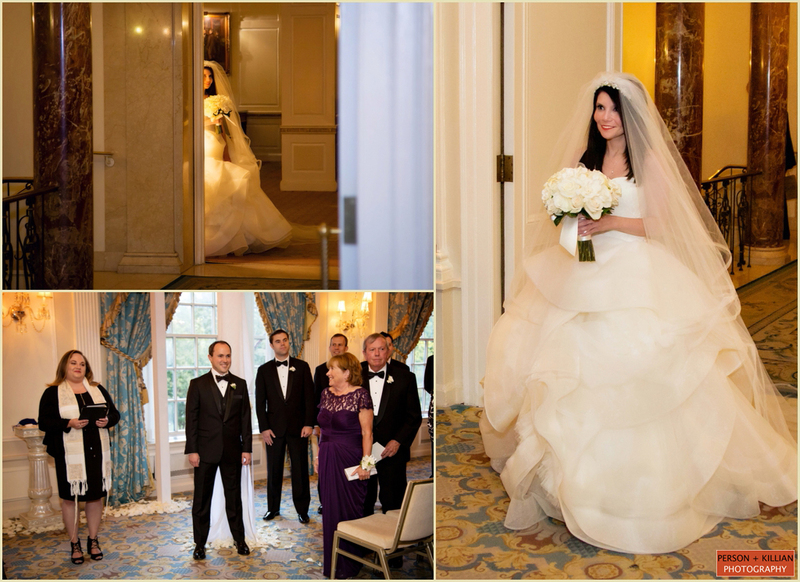 Melissa carried a beautiful bouquet of soft pink peonies as she walked down the aisle, for a perfect pop of spring color. 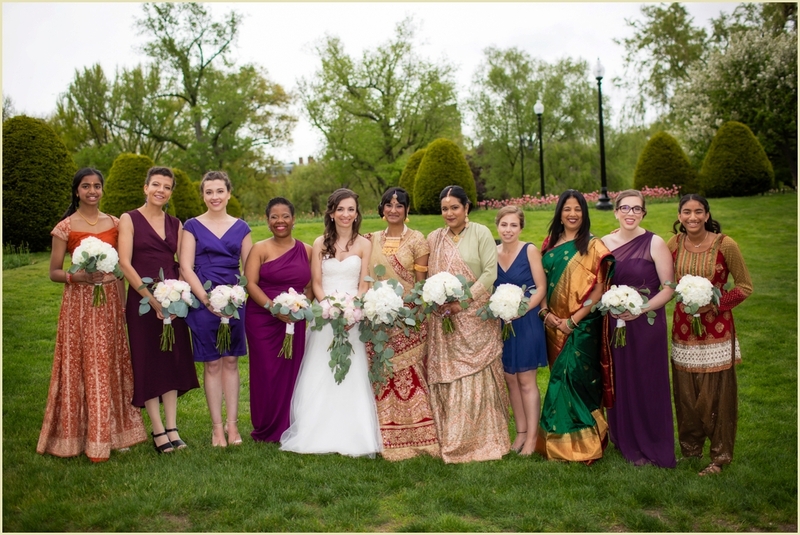 After the ceremony, we stayed on the campus for some pictures around the chapel with friends and family before heading to the Taj Boston to start the party. 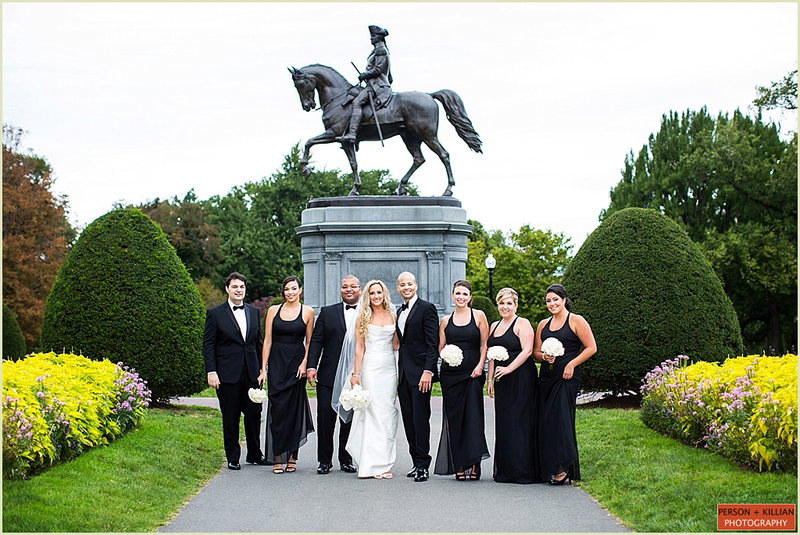 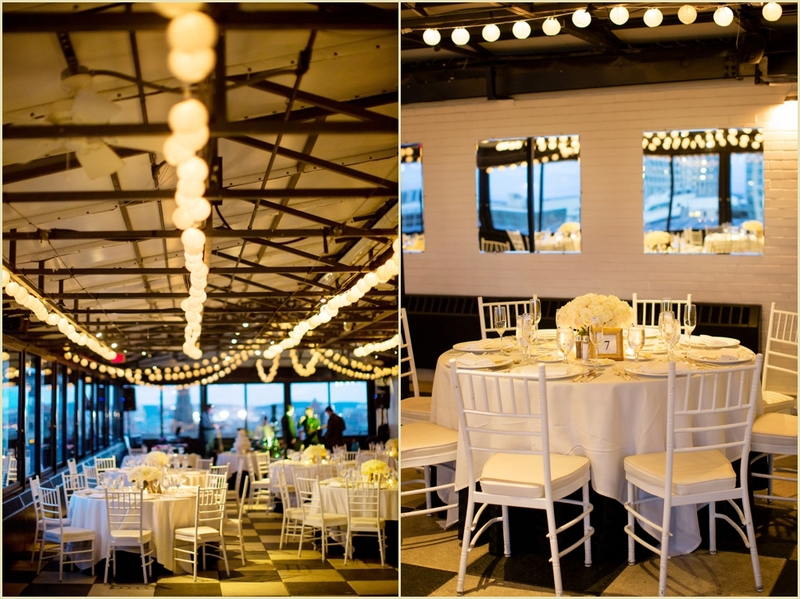 Melissa and Bill wanted their wedding to have the feeling of classic “Boston”. 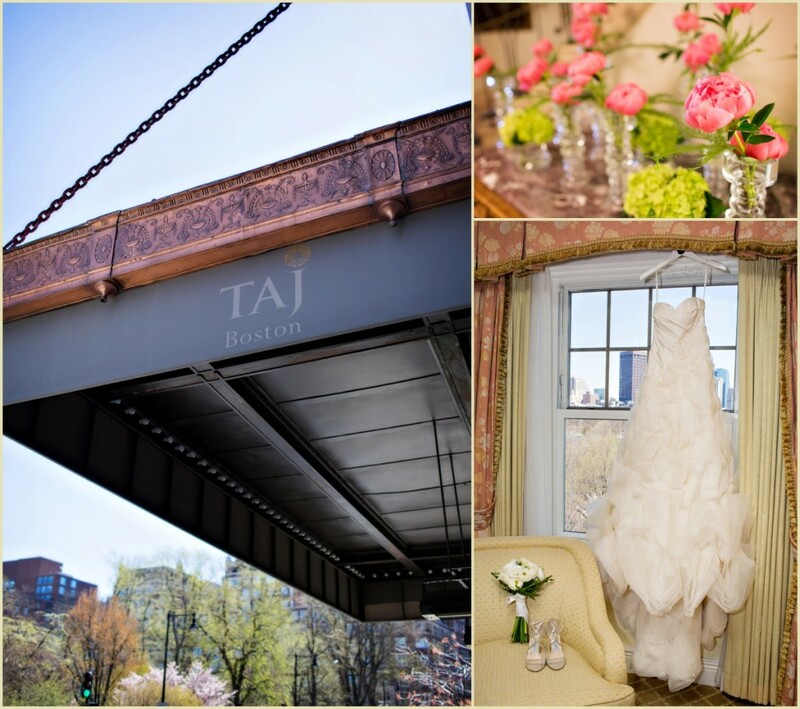 The dining room (overlooking the Public Garden and Newbury Street) at the Taj was the perfect venue for an elegant, romantic Boston wedding. 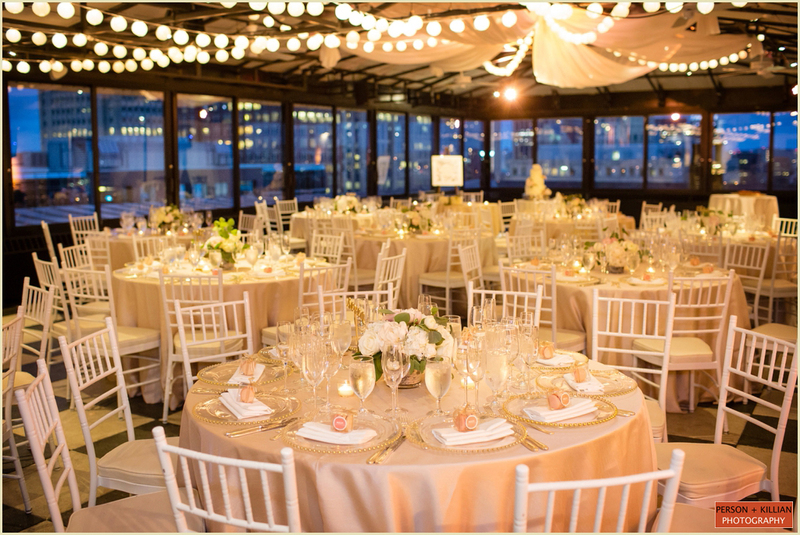 The room was warm and intimate with golden champagne linens, and multi-toned pink peonies filling the centerpieces. 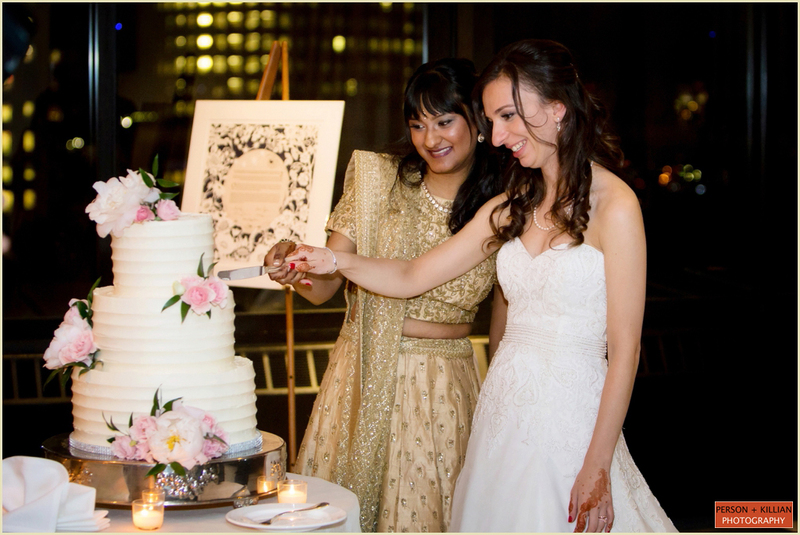 Even their white wedding cake was covered in the soft pink flowers, adding a great splash of color to the Taj Boston ballroom. 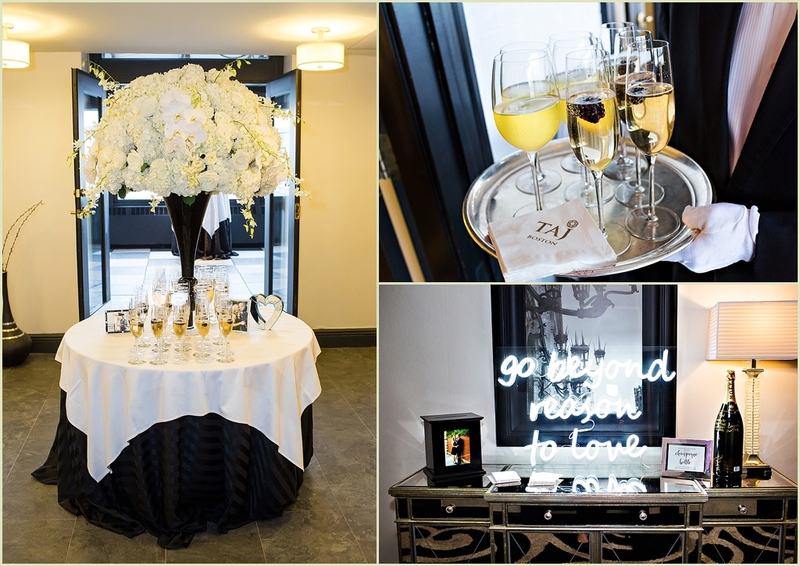 We loved the couple’s puzzle guest book where friends and family left messages on the back of puzzle pieces for Melissa and Bill. 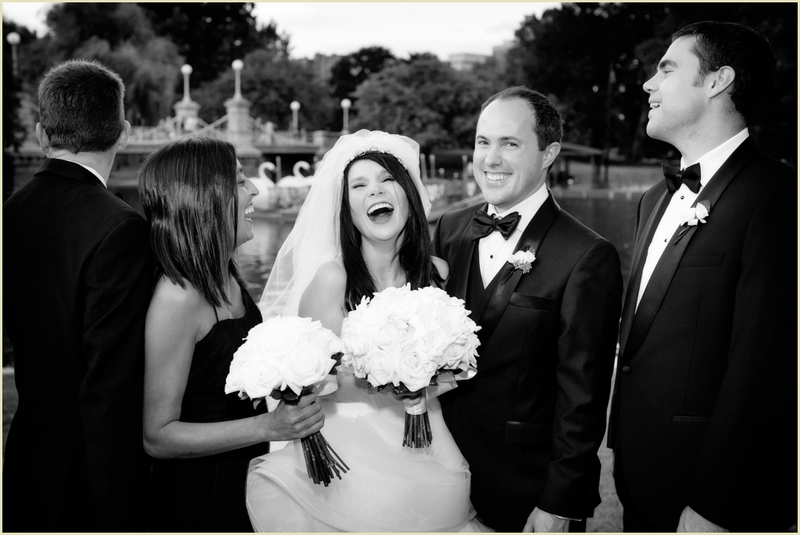 The front of the puzzle was their favorite photo from their engagement session. 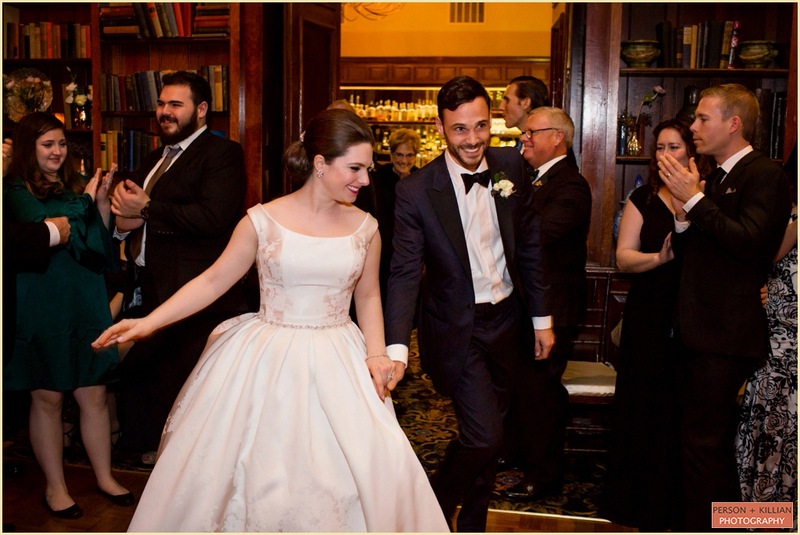 Everyone was so happy to be celebrating this great couple, thank you to the newlyweds for letting us be a part of your special day.